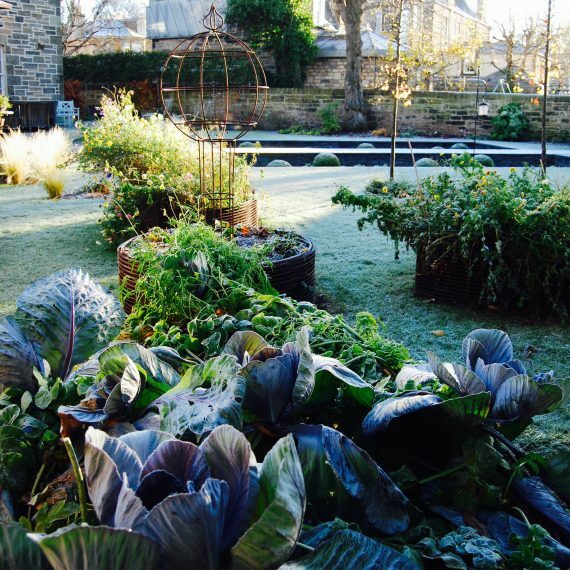 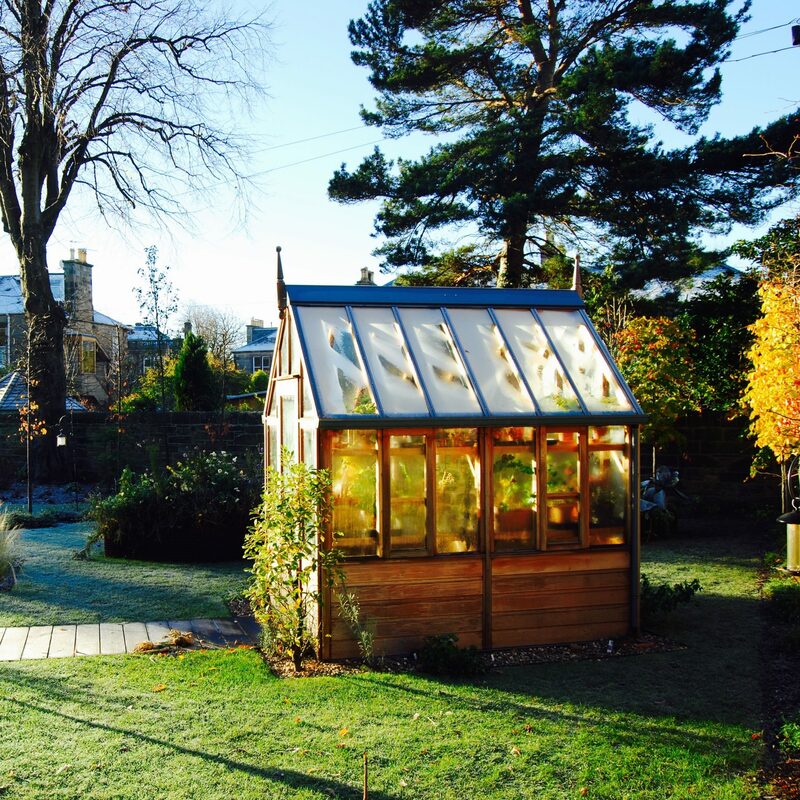 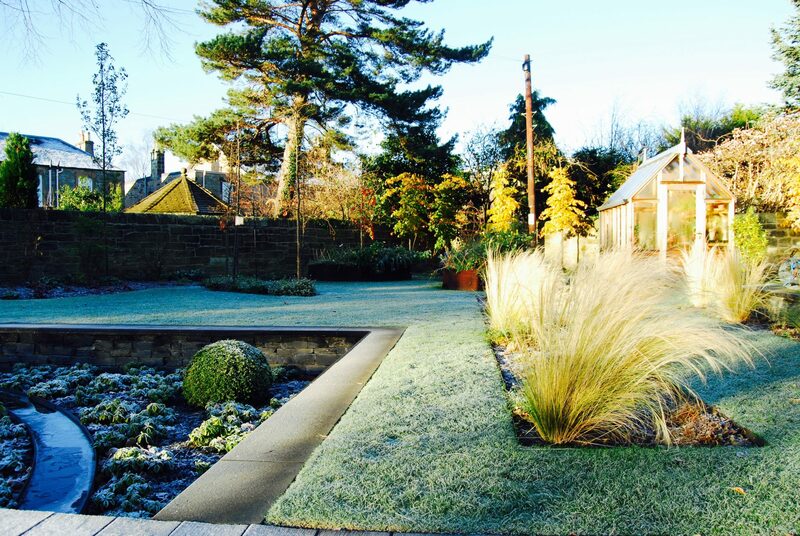 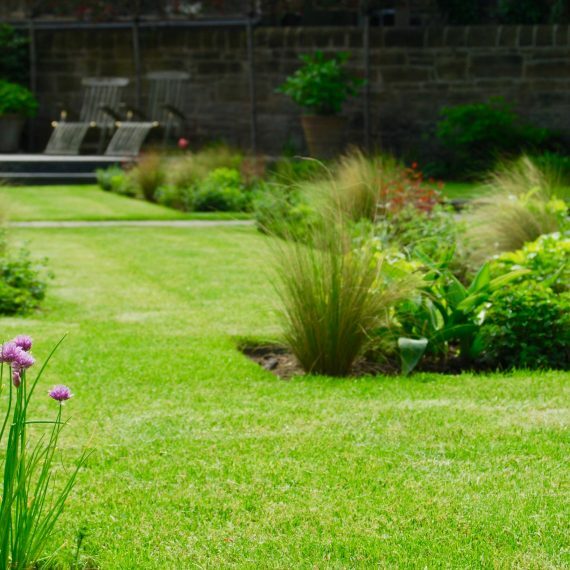 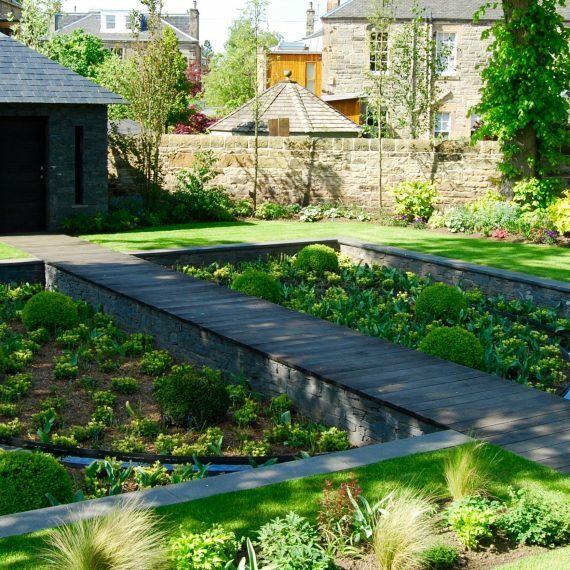 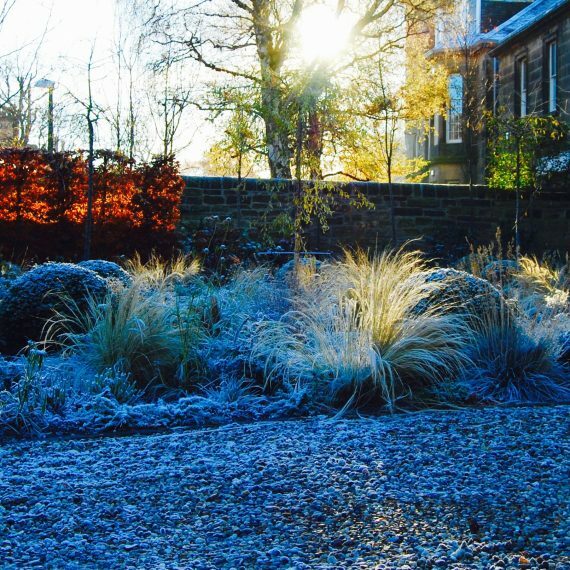 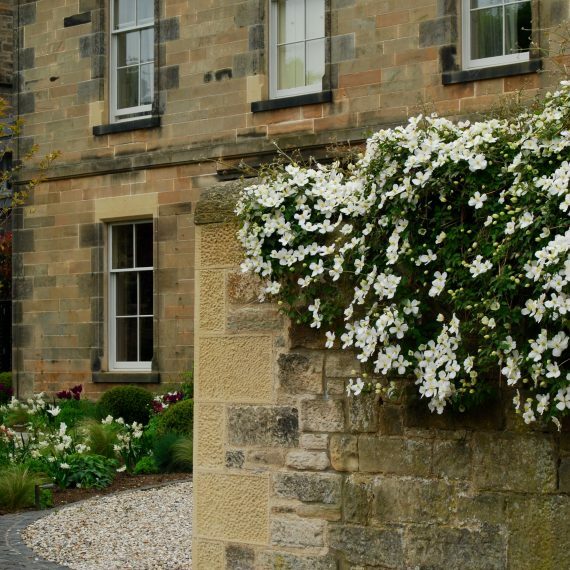 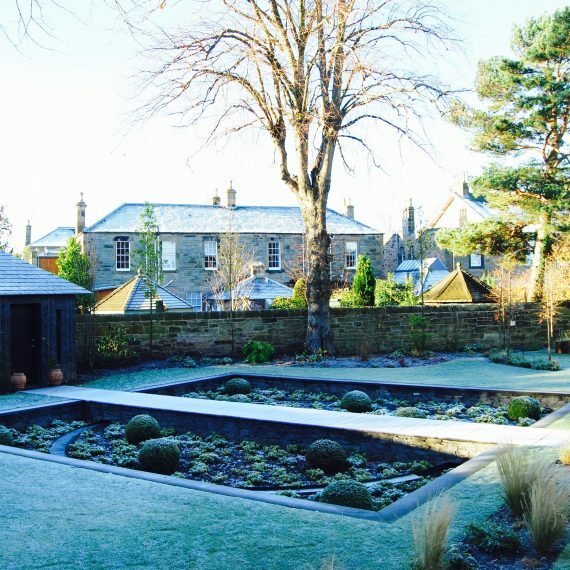 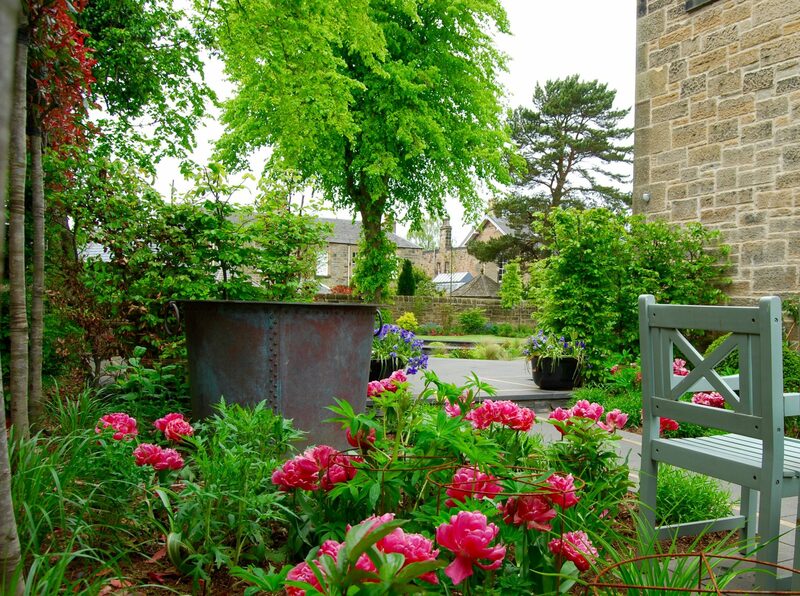 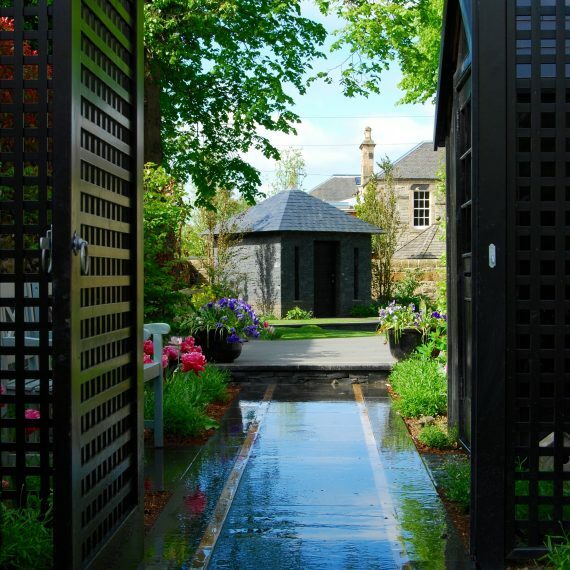 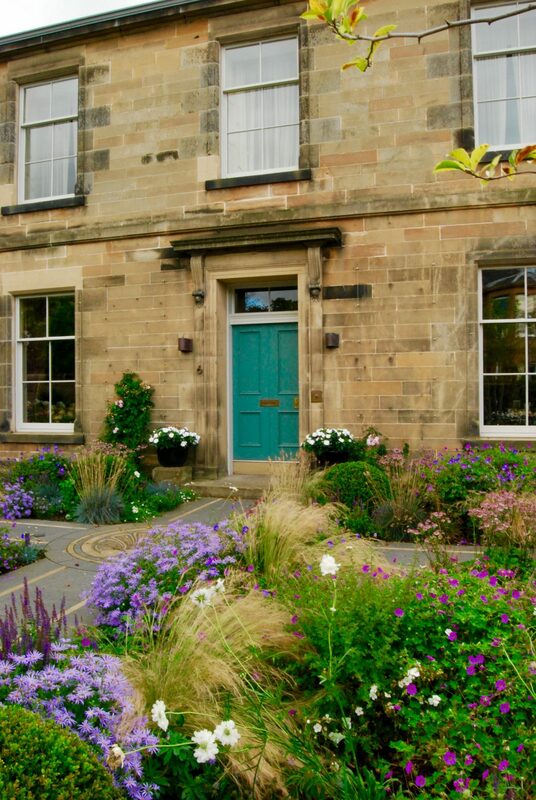 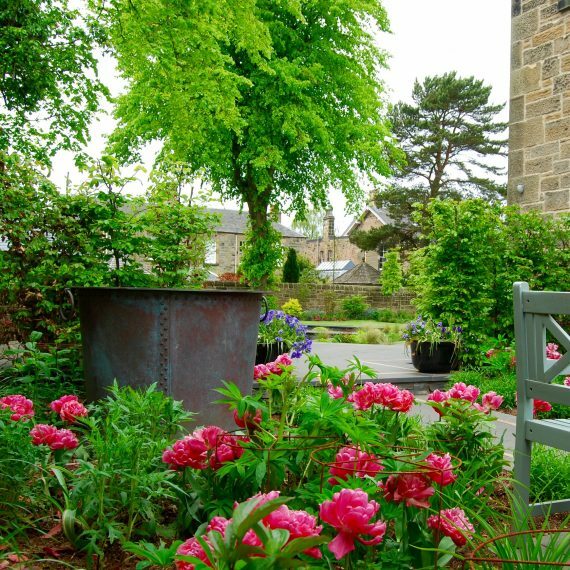 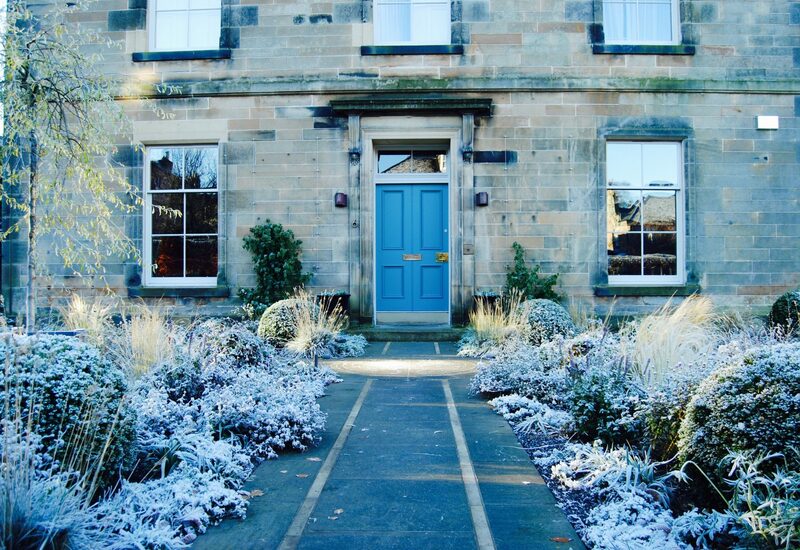 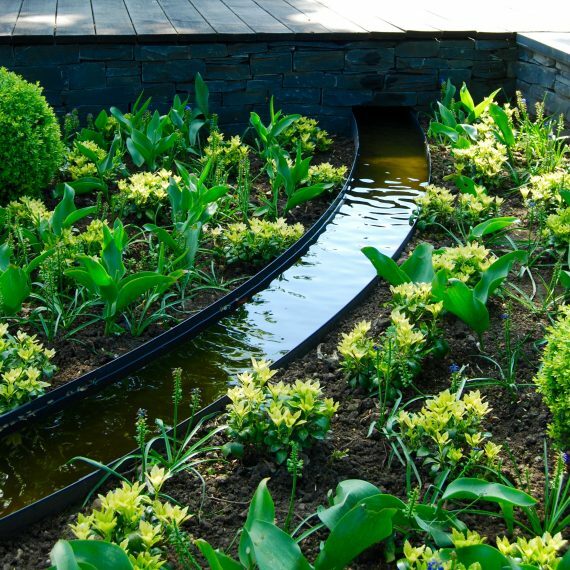 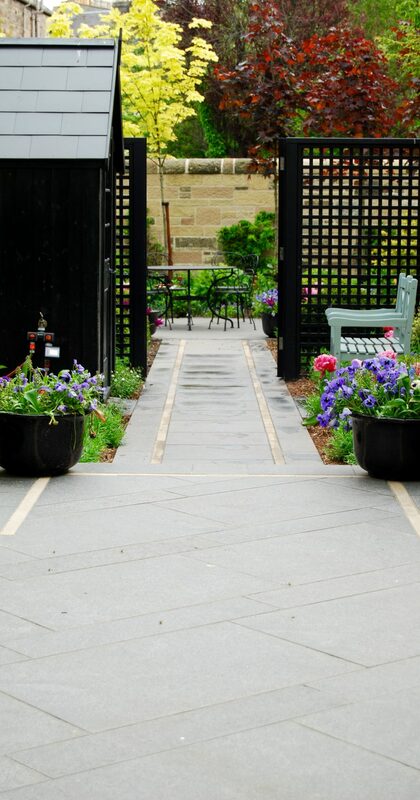 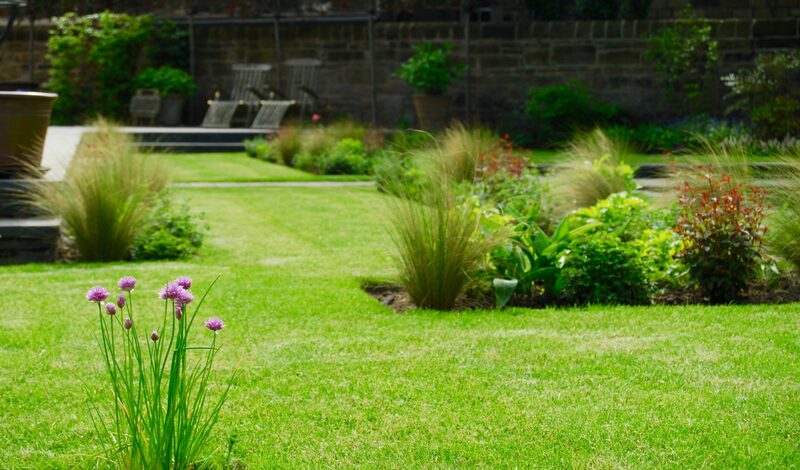 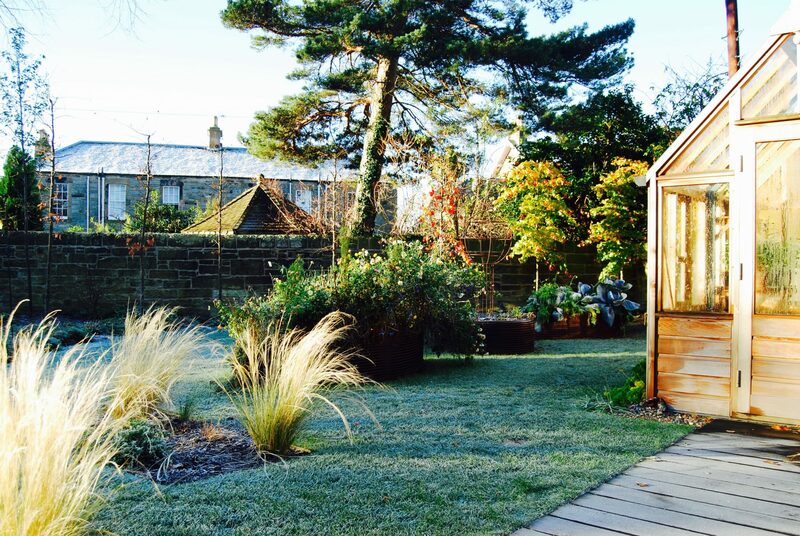 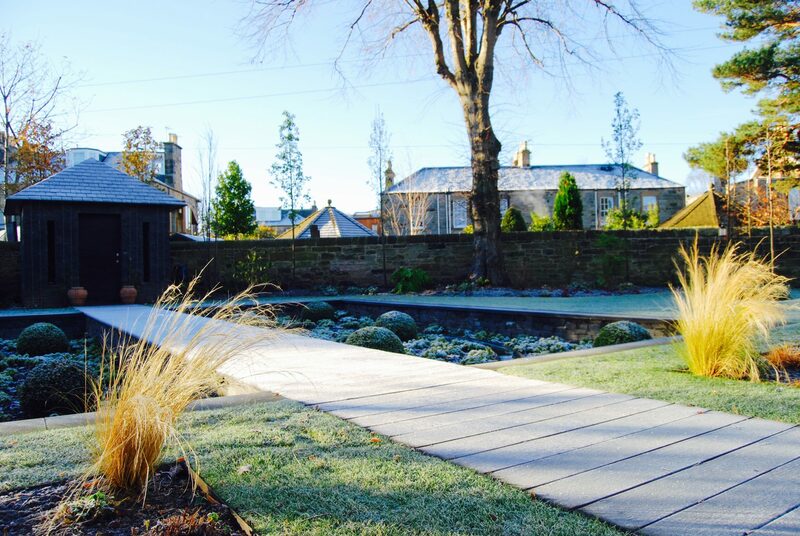 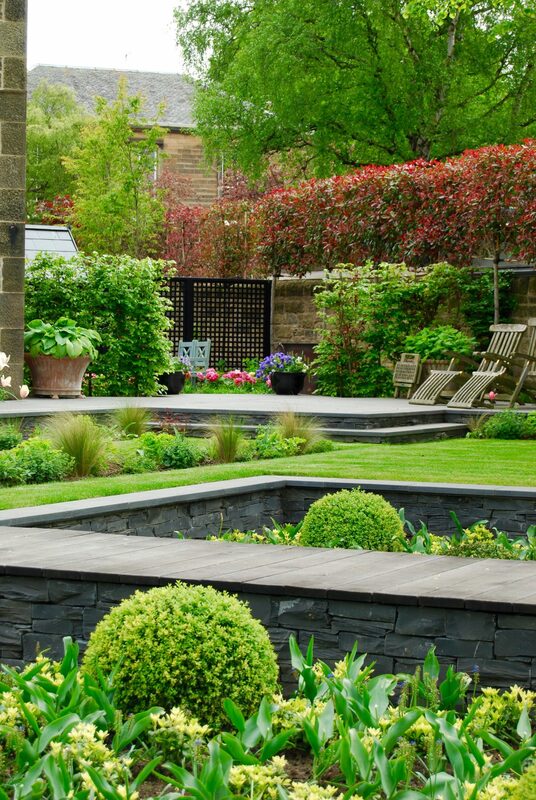 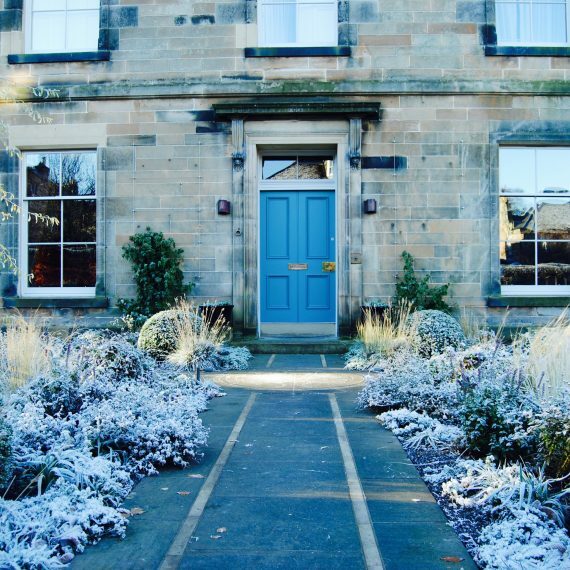 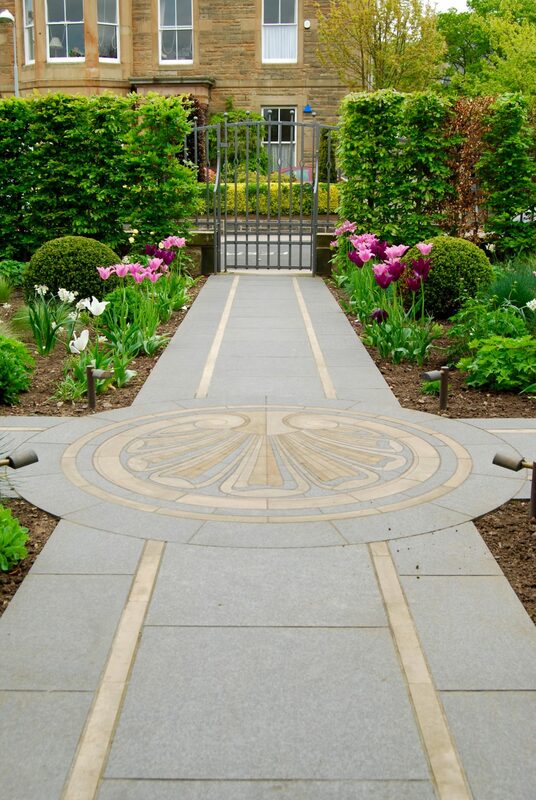 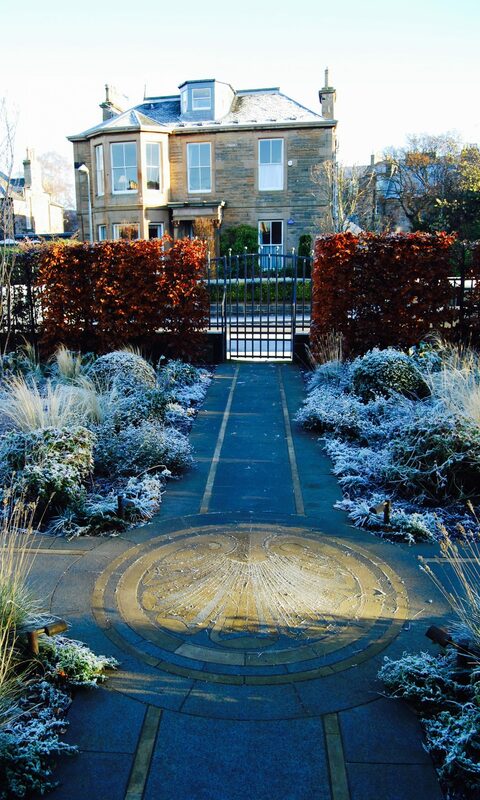 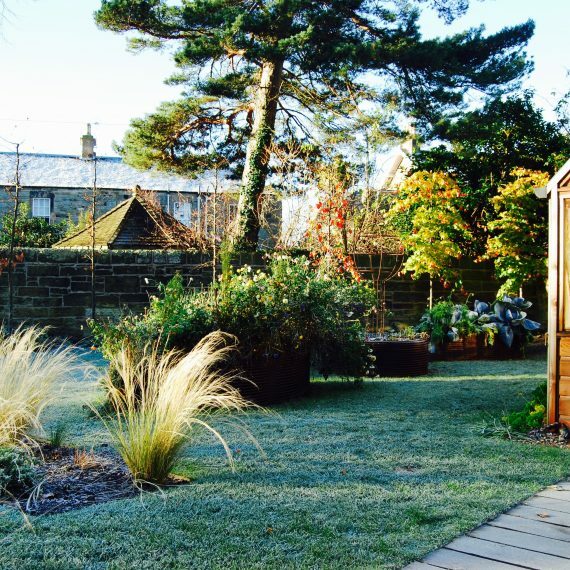 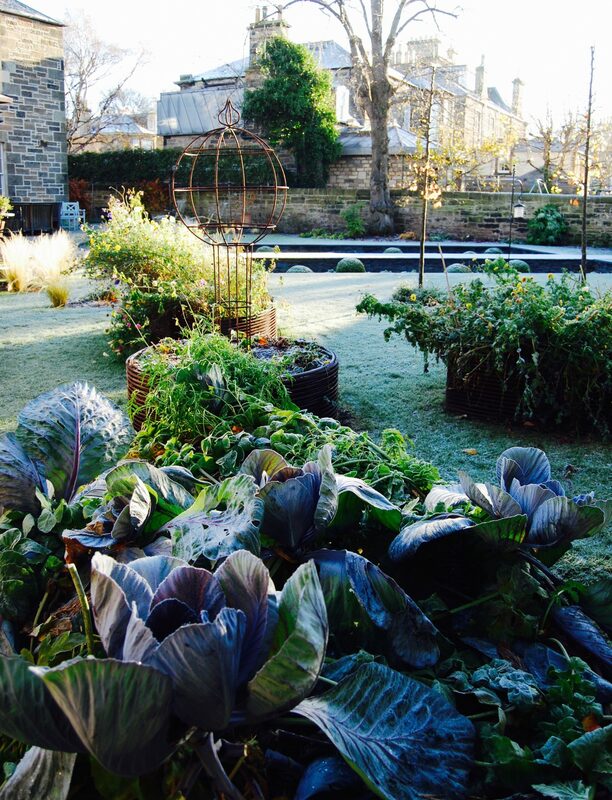 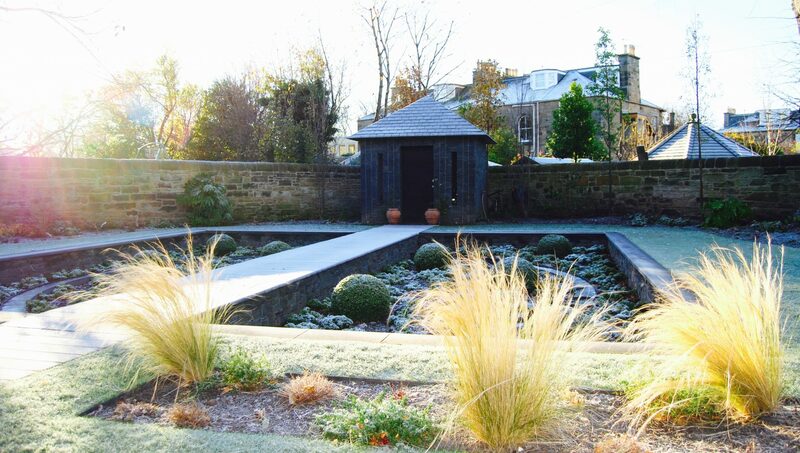 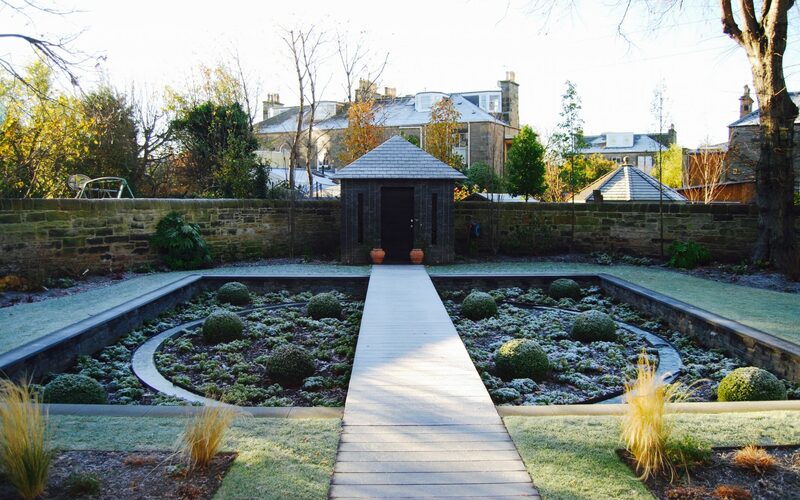 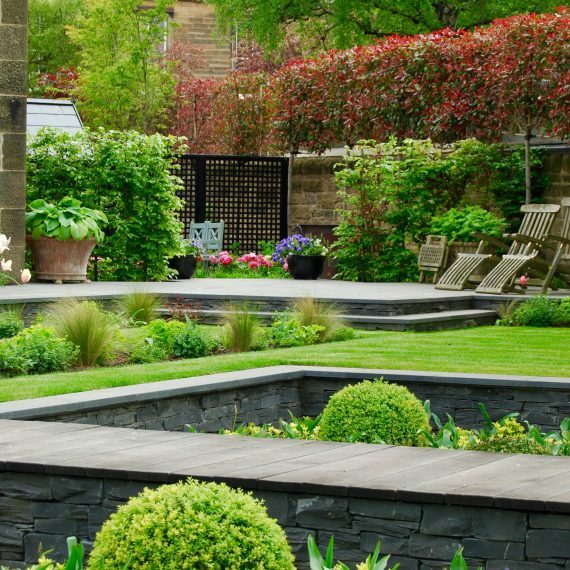 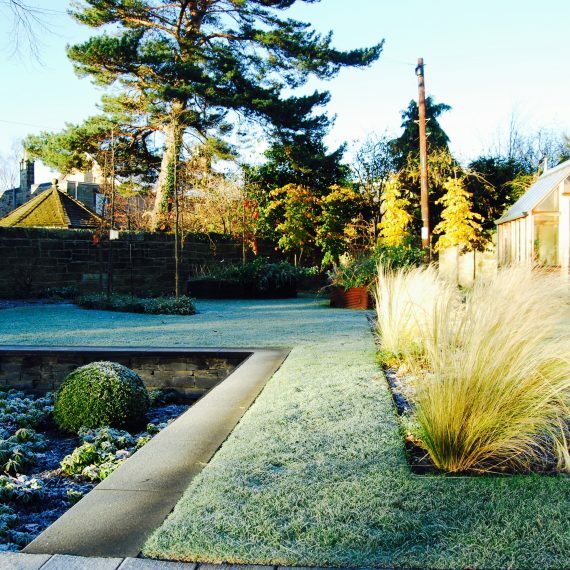 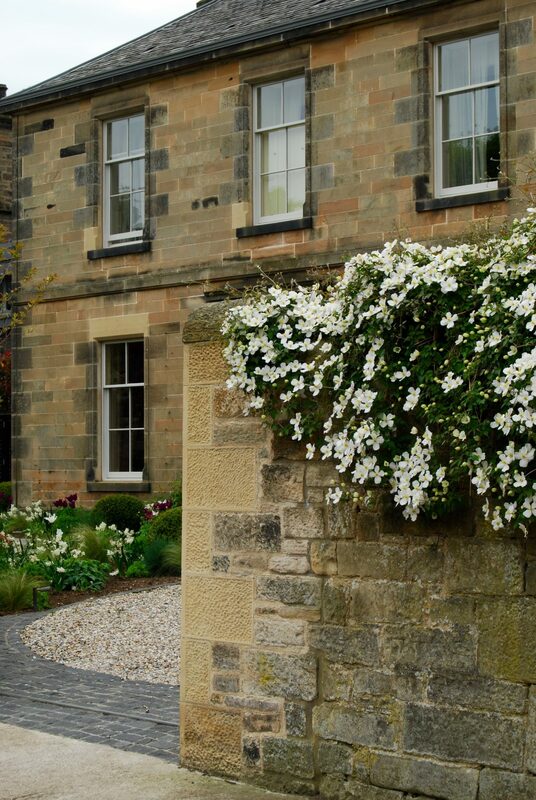 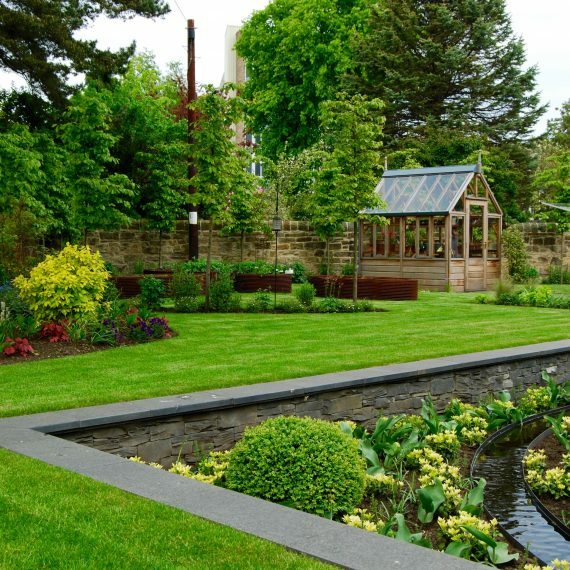 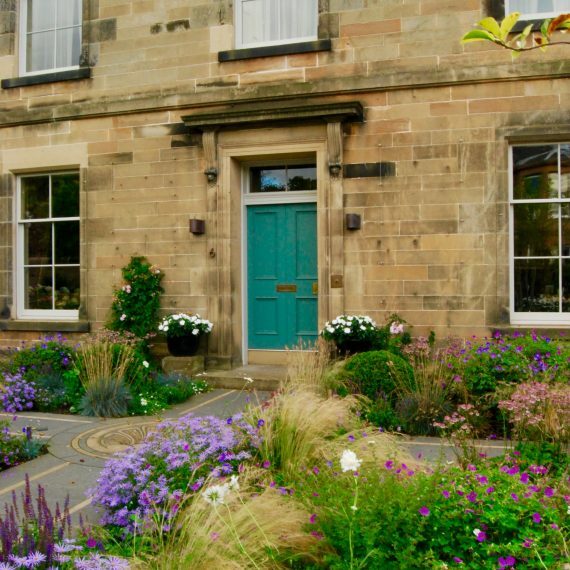 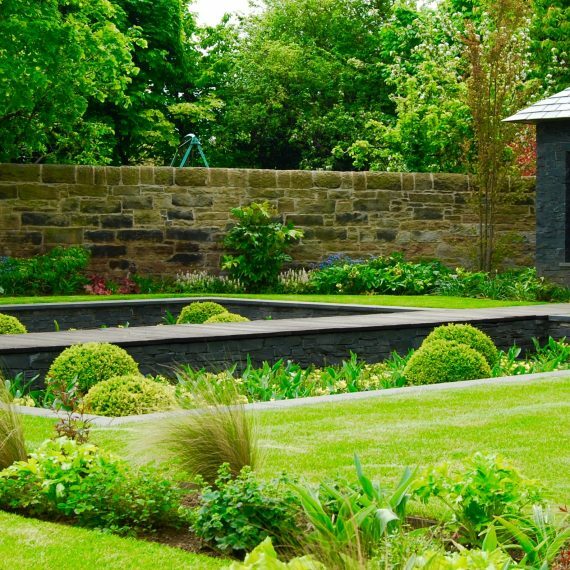 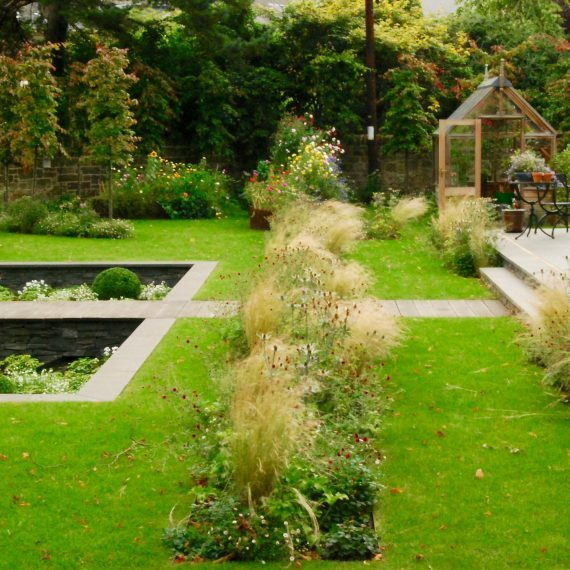 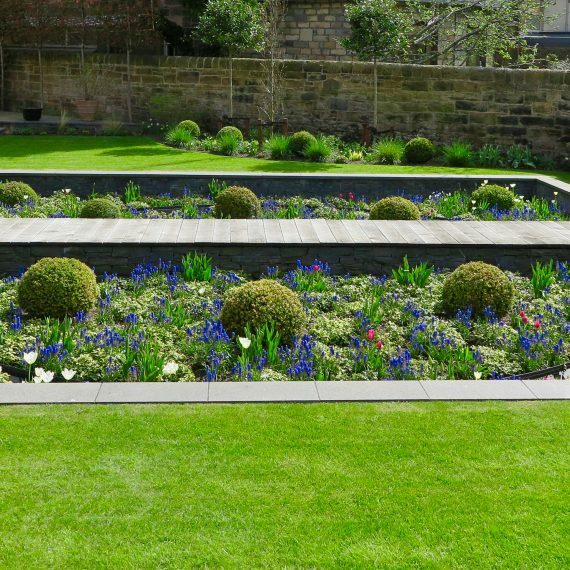 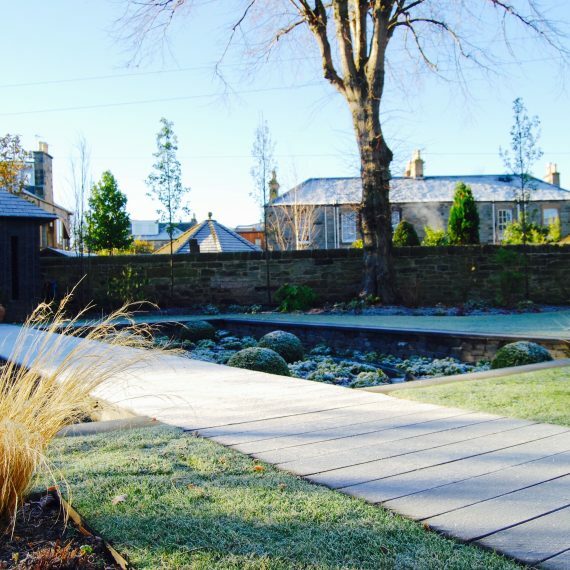 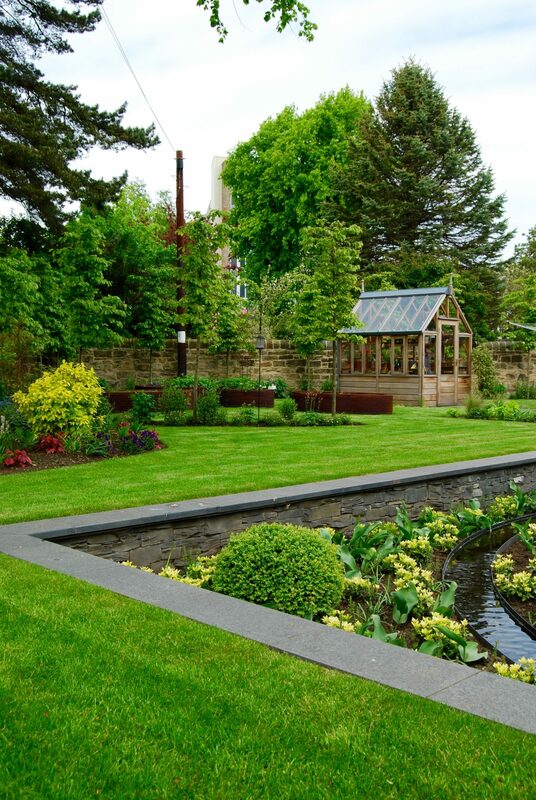 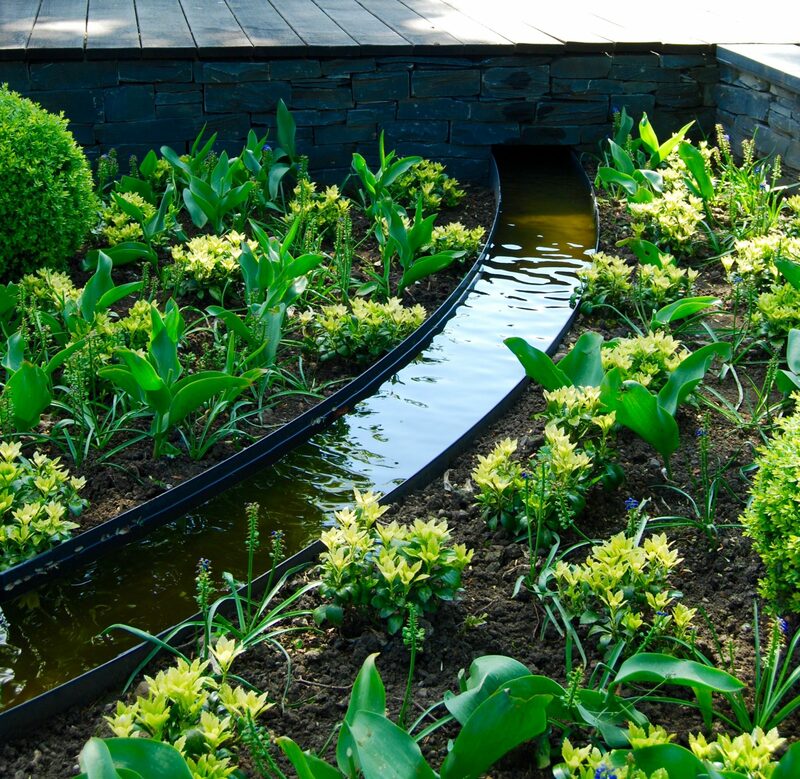 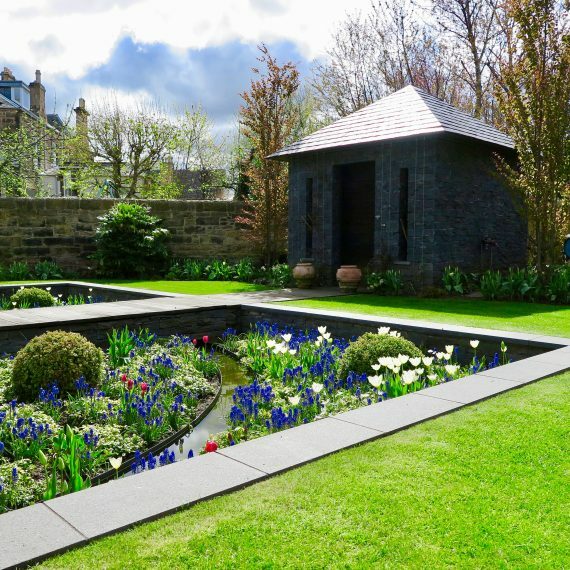 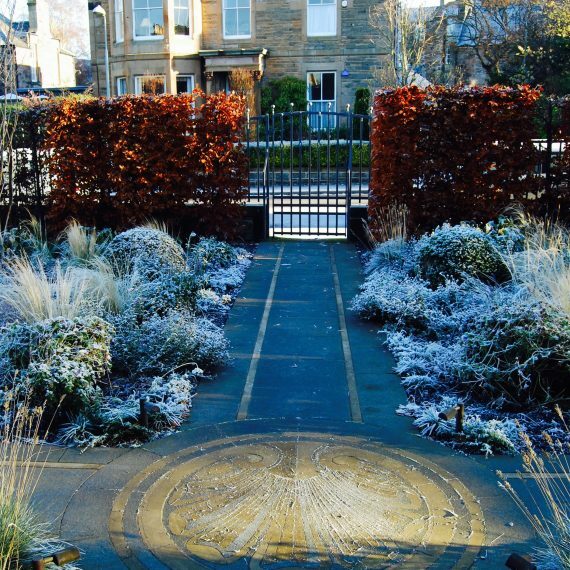 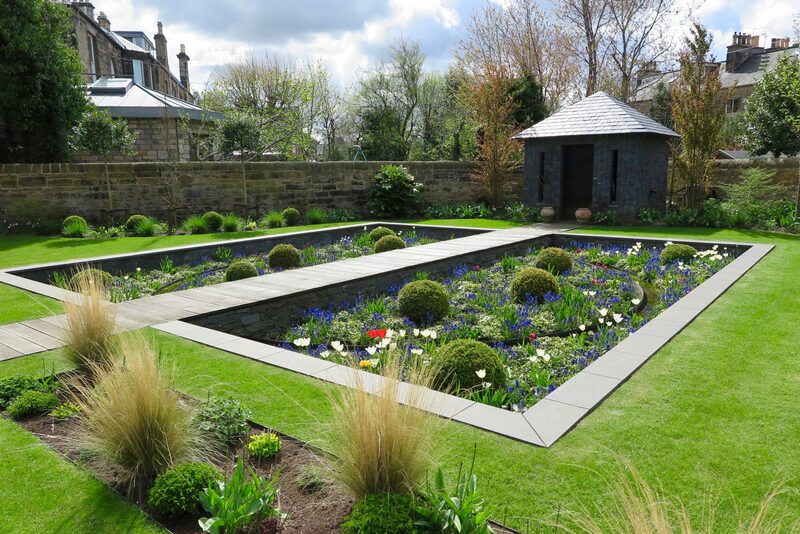 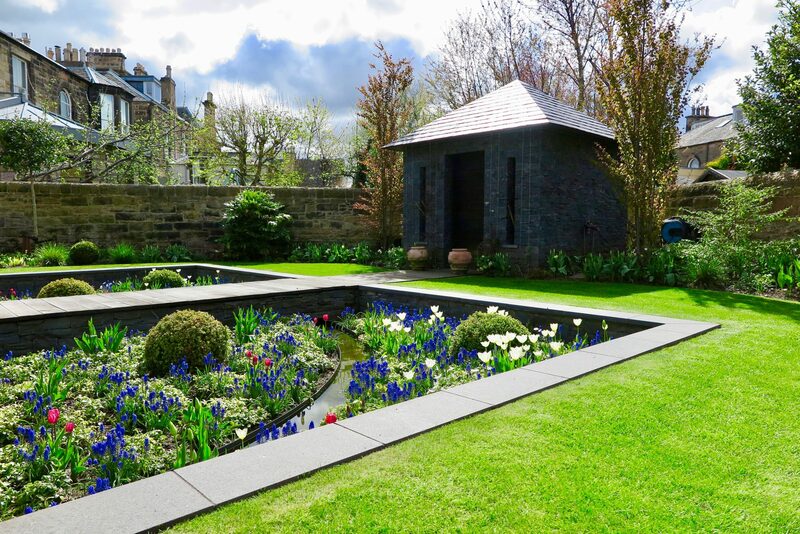 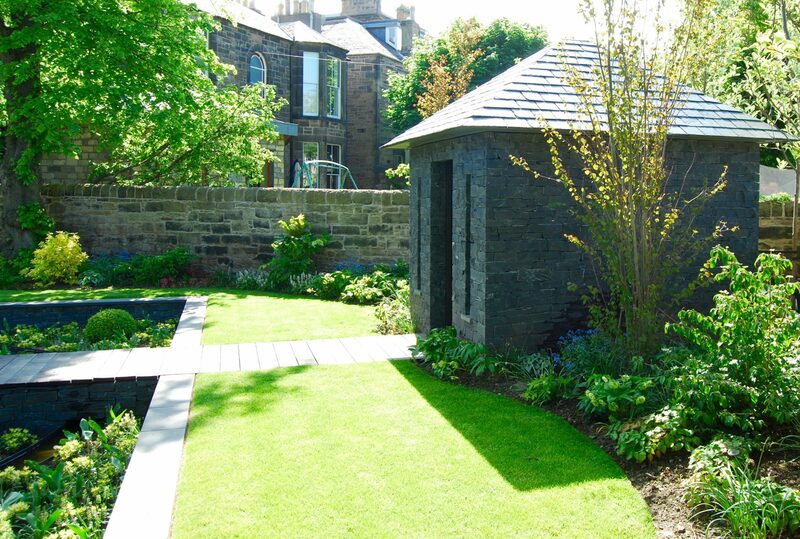 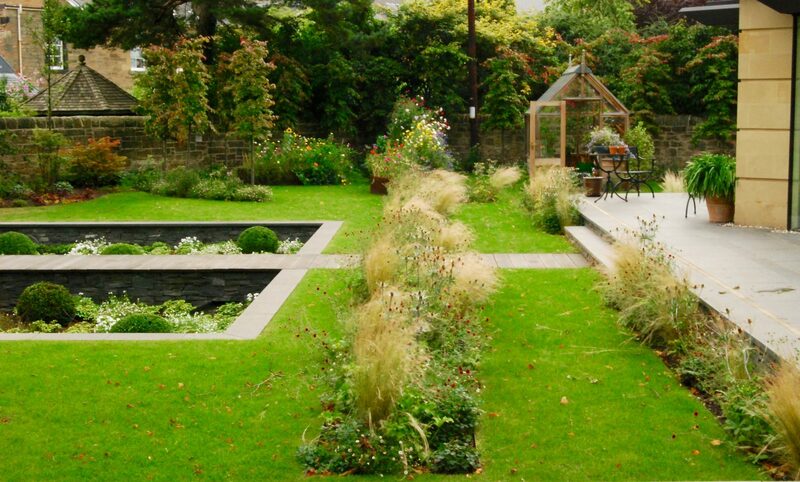 I designed this Merchiston garden in 2013 for clients I had worked with before in the New Town and in Boat of Garten. 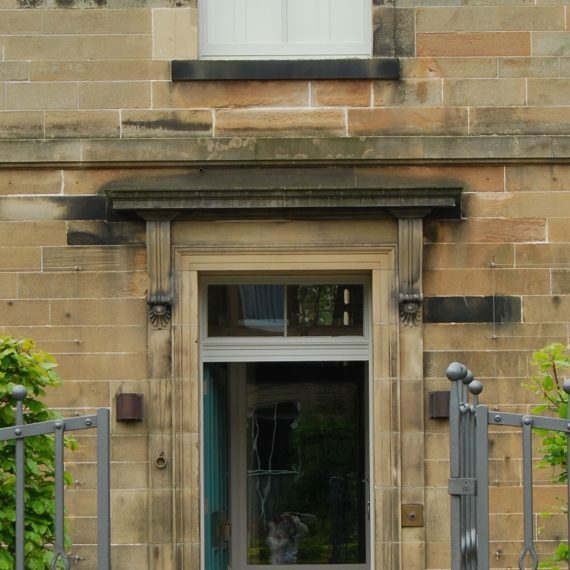 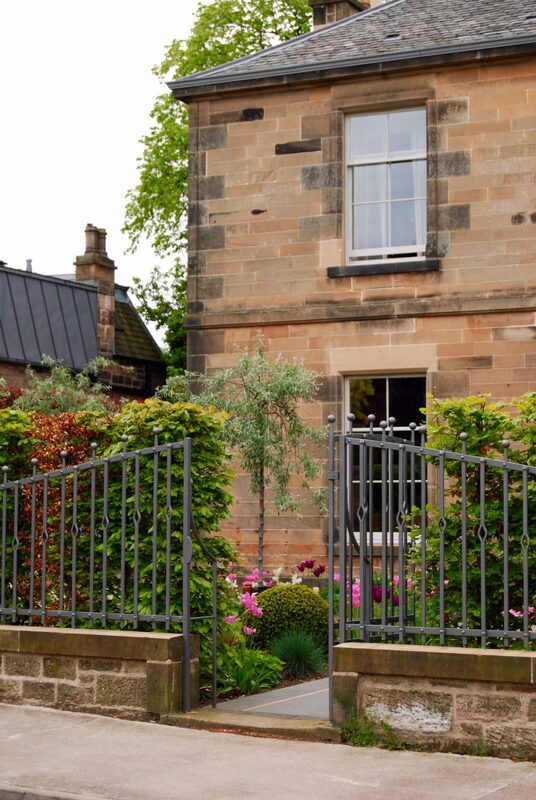 They bought this sandstone villa in need of complete renovation and asked me to design a garden with plenty of wow factor which would match the high spec interior. 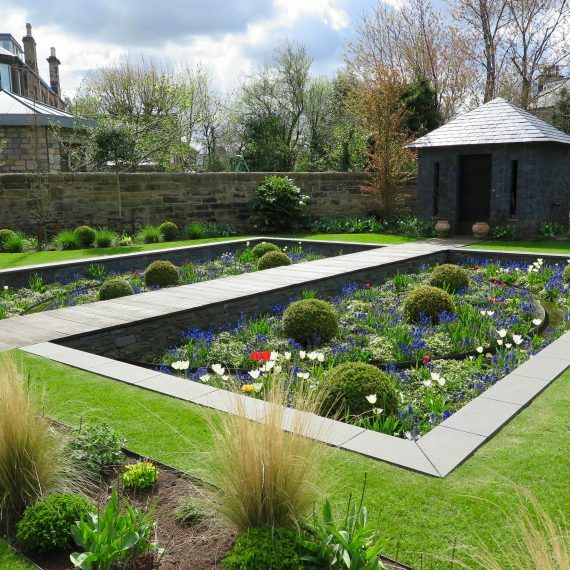 The project took until 2016 to complete and in December of that year it won a Principal BALI award for the landscaper, Water Gems. 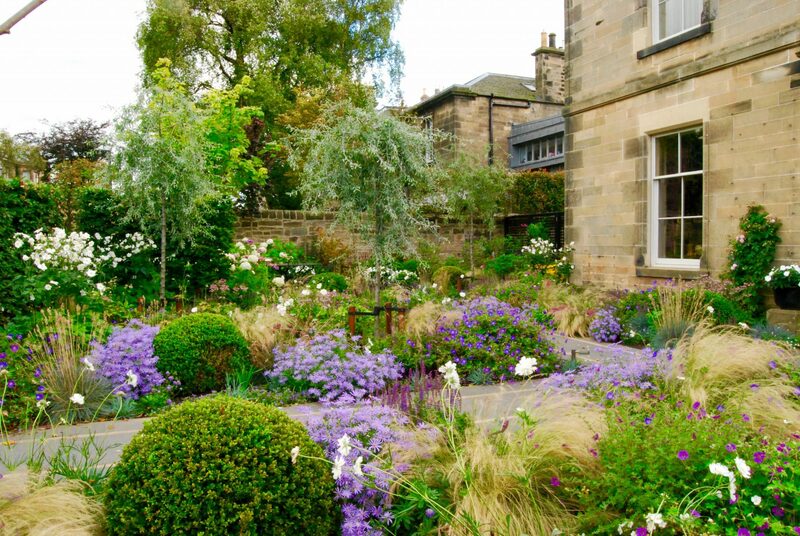 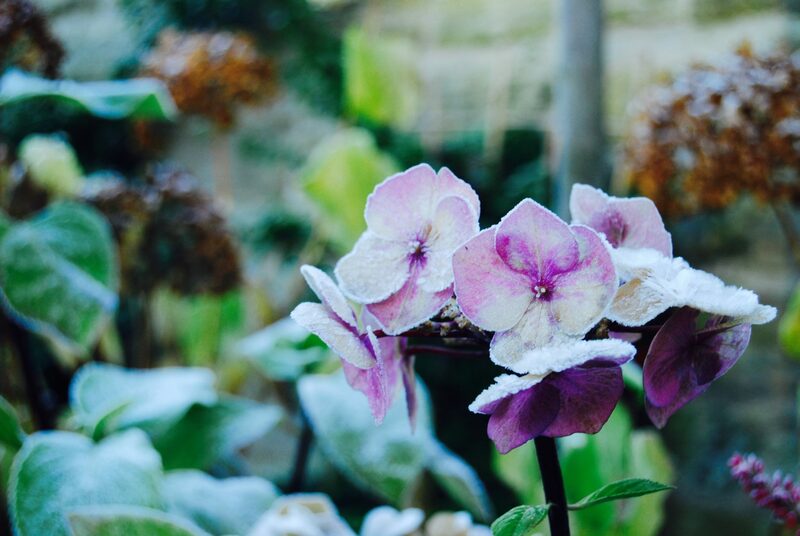 When I first looked at the property it was clear the overgrown gardens had once been thoughtfully planted. 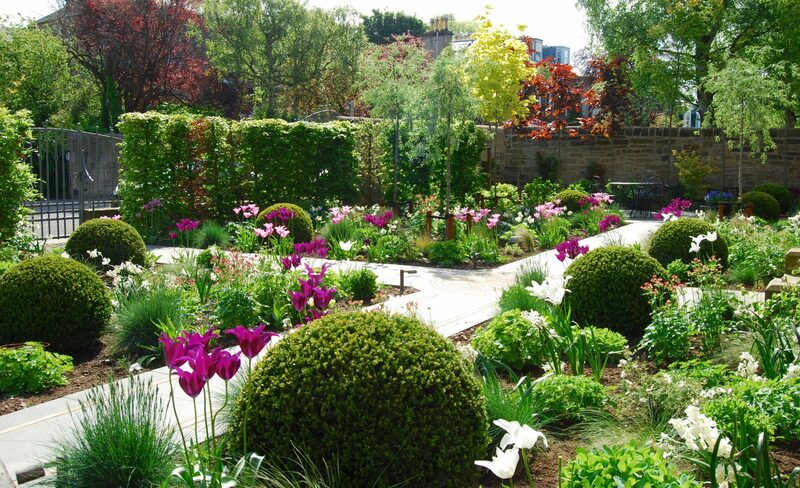 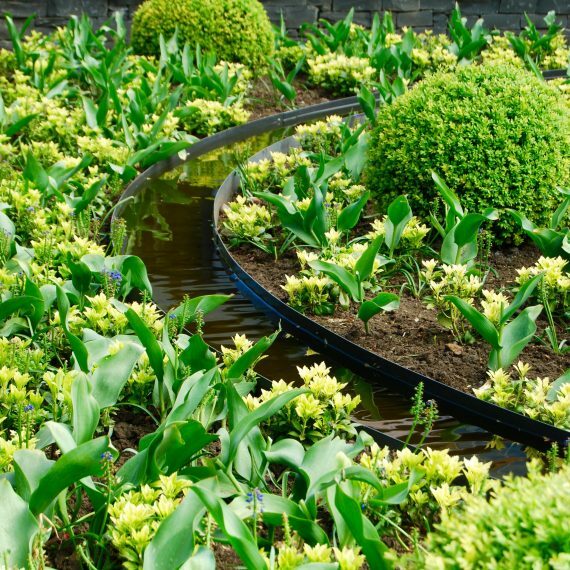 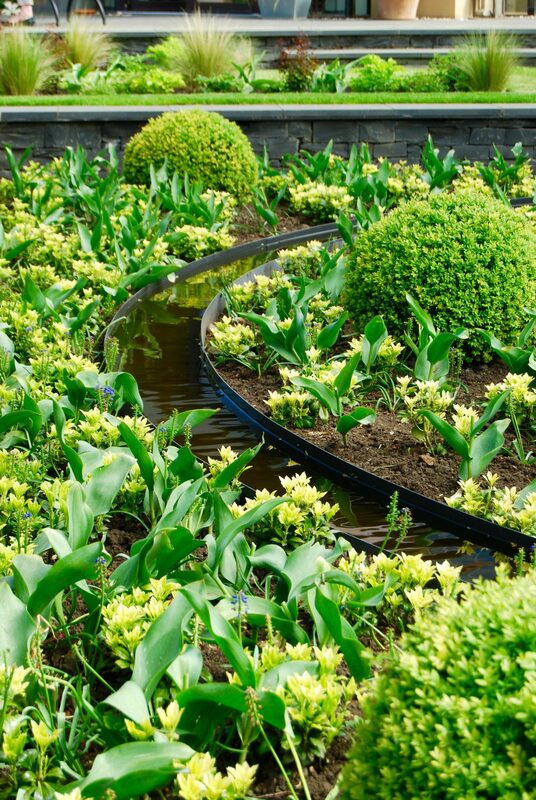 However, years of neglect had left borders out of control and shrubs and trees shapeless and unmanageable. 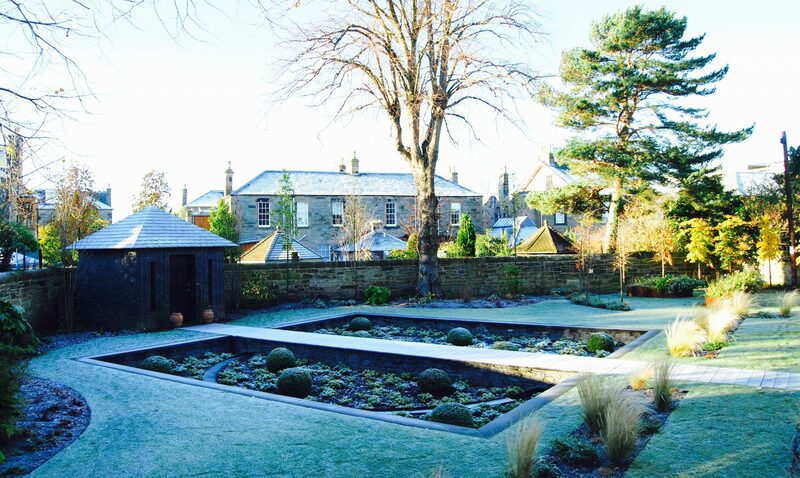 The clients agreed we should start from scratch and with the exception of two lime trees, the garden was cleared. 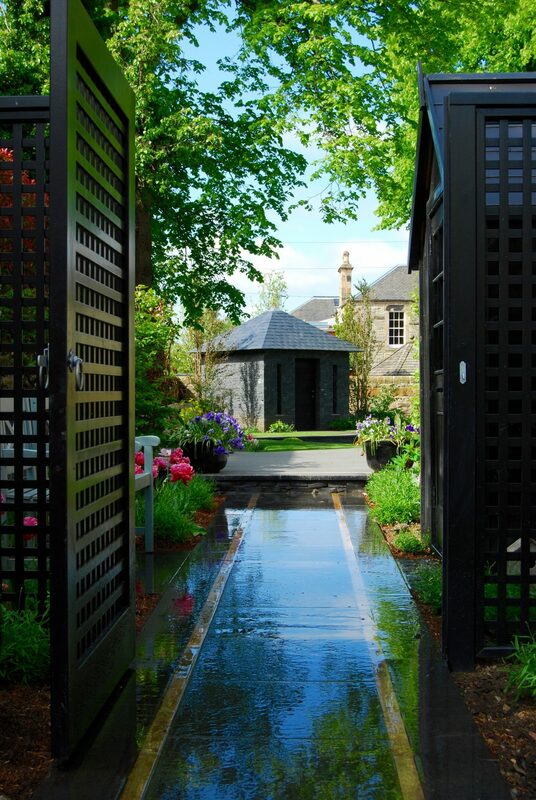 The design needed to address the squareness of the back garden and so I decided to create a diagonal line of vision starting at the modern extension designed by Nigel Somner and his team at Somner Macdonald Architects. 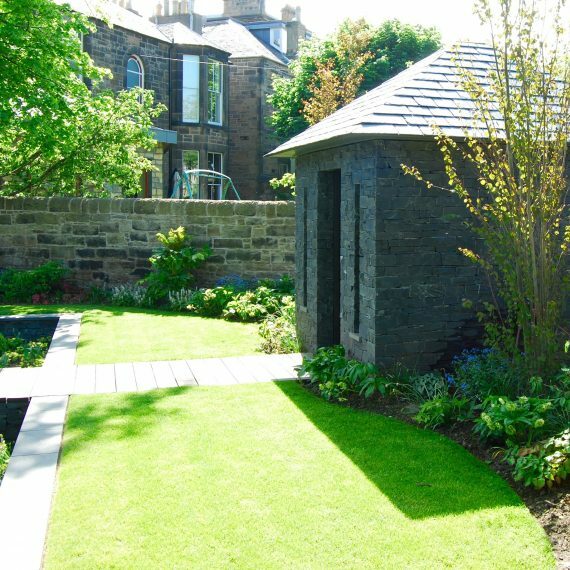 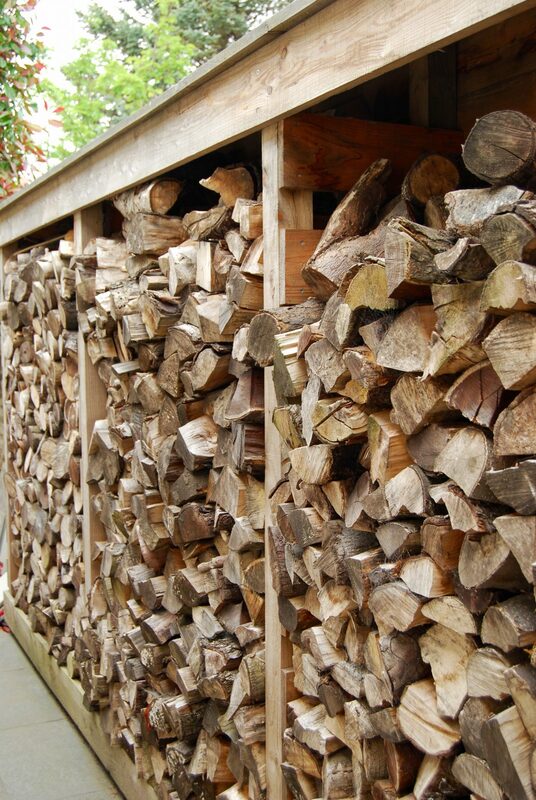 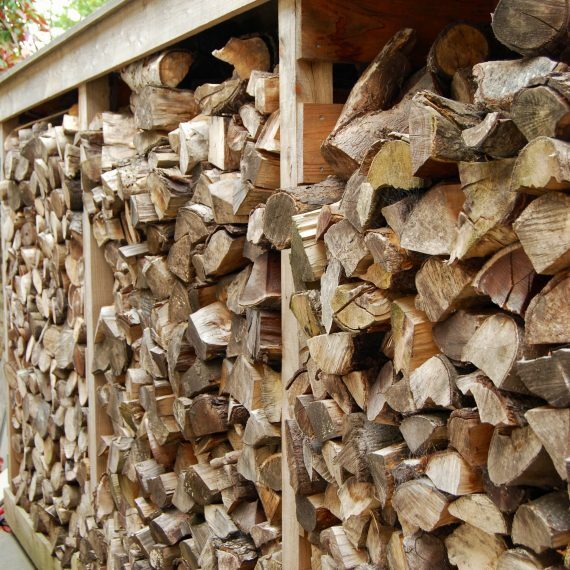 We worked together in the early design stages so we were able to ensure the designs inside and out worked hand in hand. 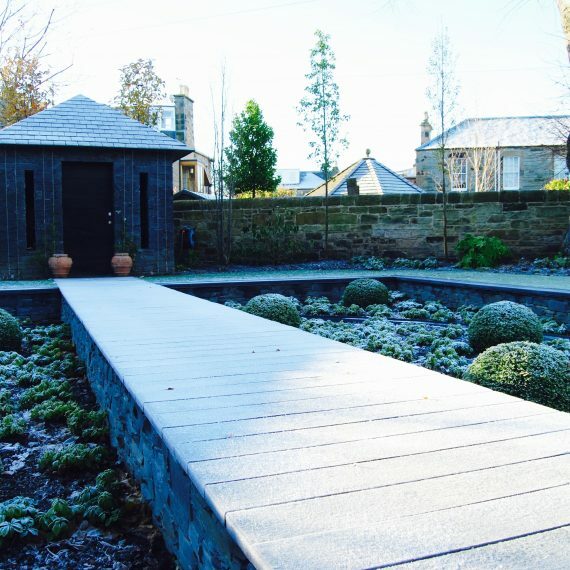 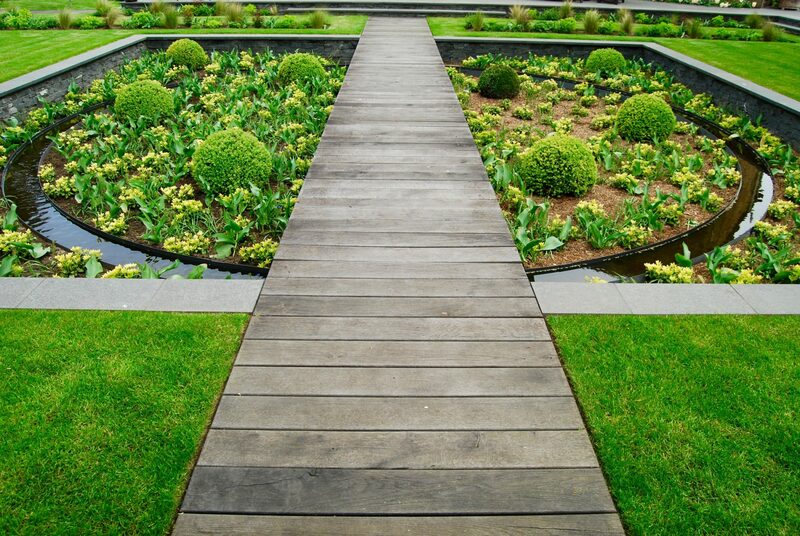 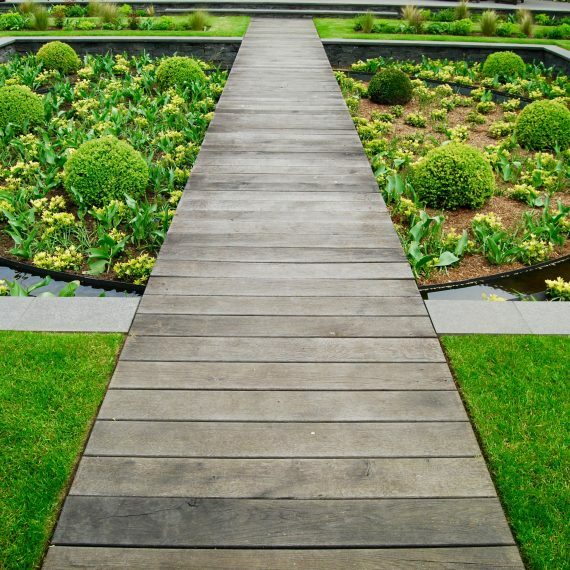 I used a scorched oak boardwalk which runs across the sunken garden with circular rill to lead the eye to a slate and stone building in the corner of the garden. 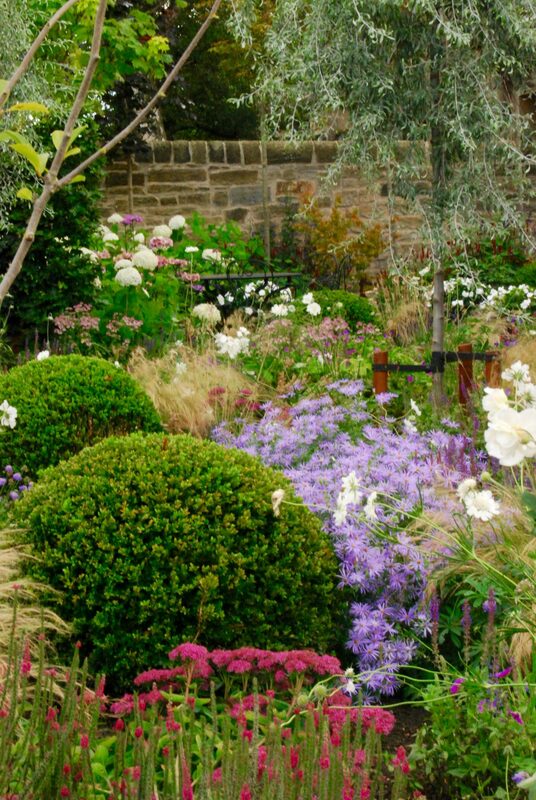 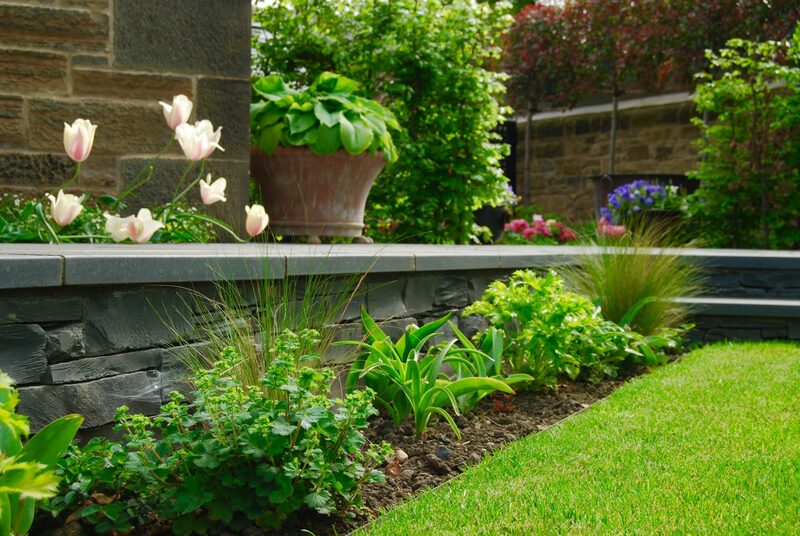 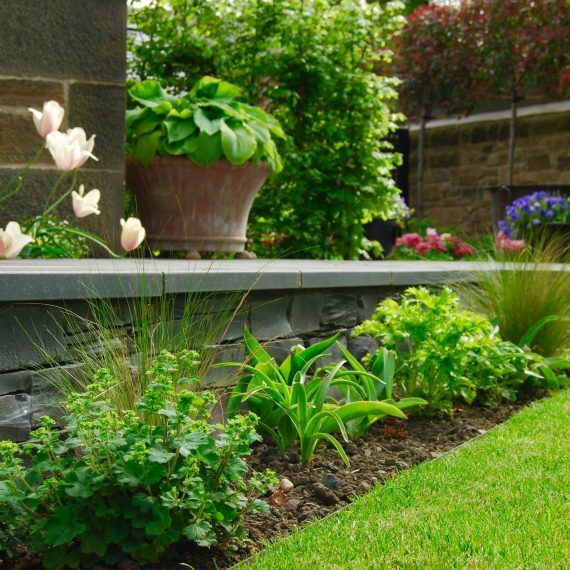 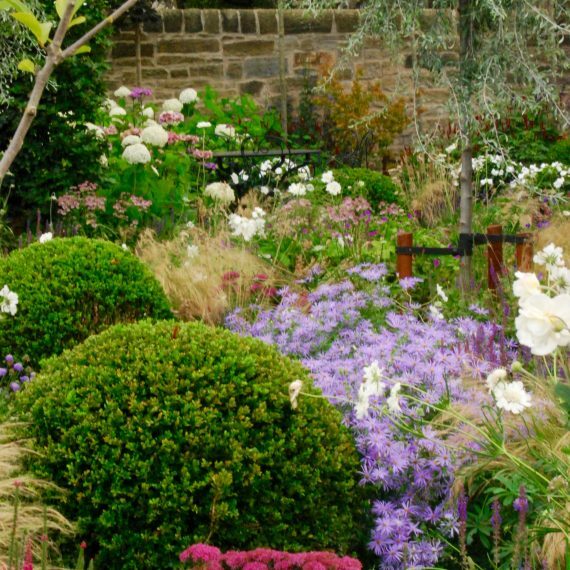 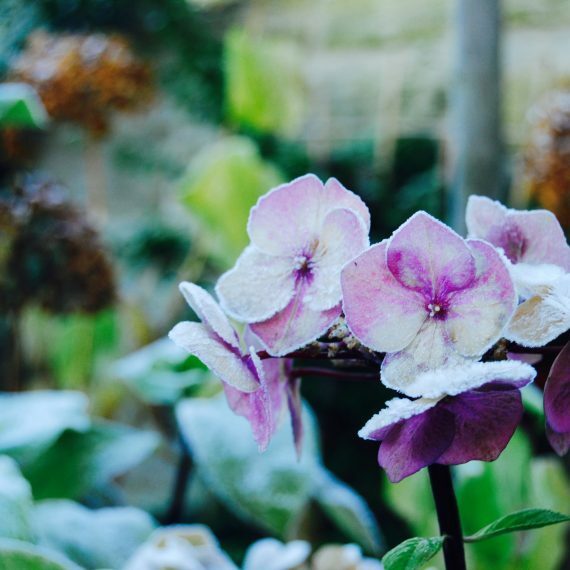 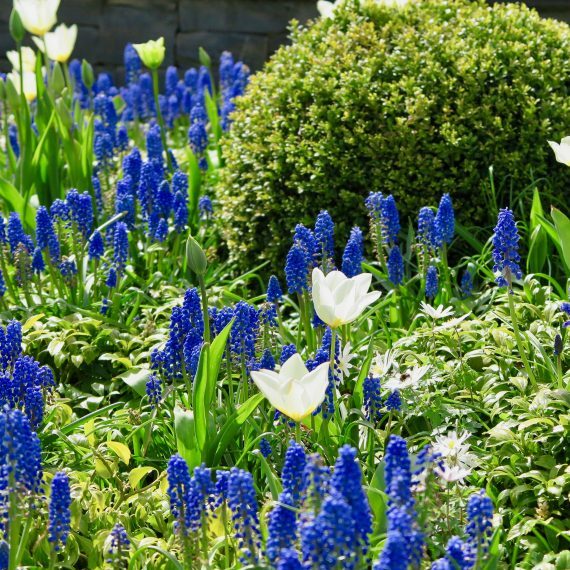 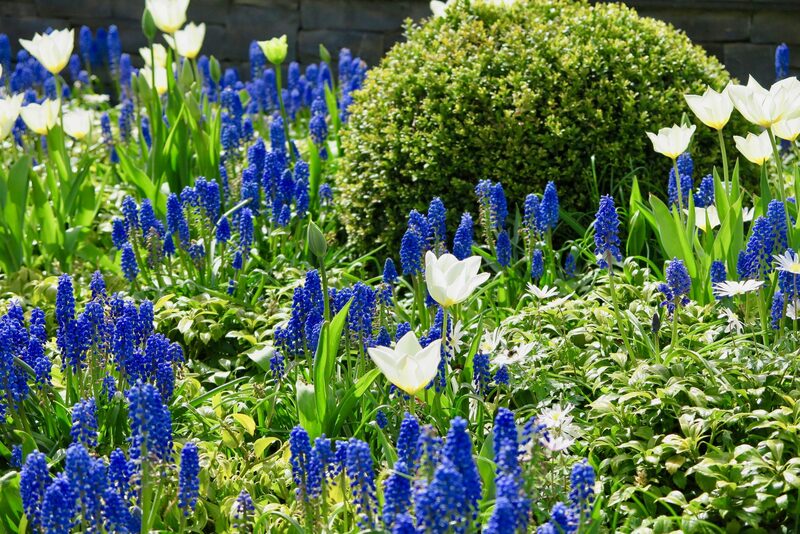 Lush planting using long-flowering herbaceous plants and grasses as well as shrubs such as Nandina Domestica, Philadelphus Coronarius aurea and Euonymus Alatus fill the garden with colour and interest all year round. 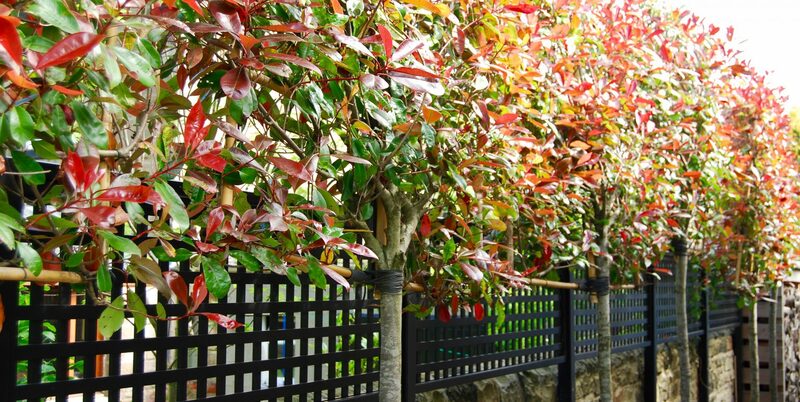 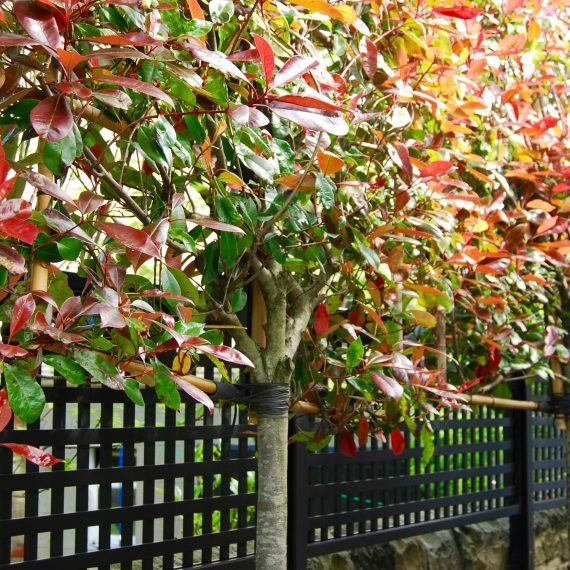 Clipped box balls in the sunken garden create form and rows of Parrotia and pleached Photinia provide foliage and privacy lost in the clearance operation. 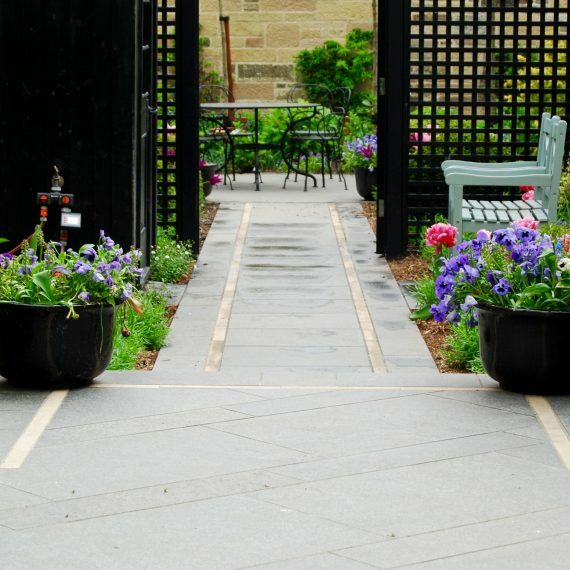 A Gabriel Ash greenhouse provides another focal point closer to the house and is filled with the client’s colourful pelargoniums, chilli peppers and tomatoes while raised woven rebar beds provide an opportunity for sweet peas, herbs and vegetables. 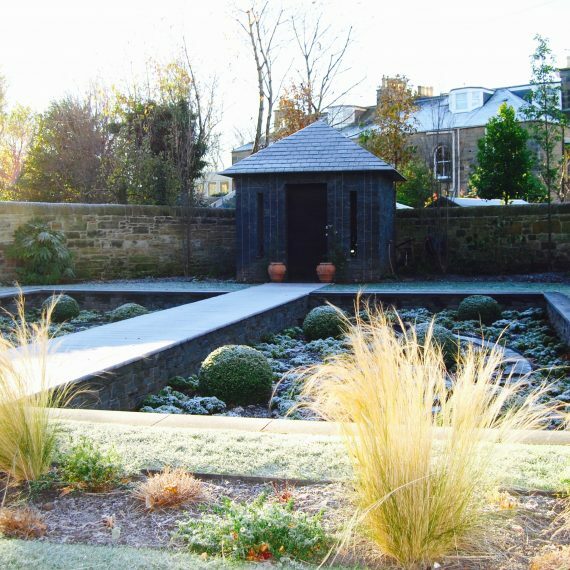 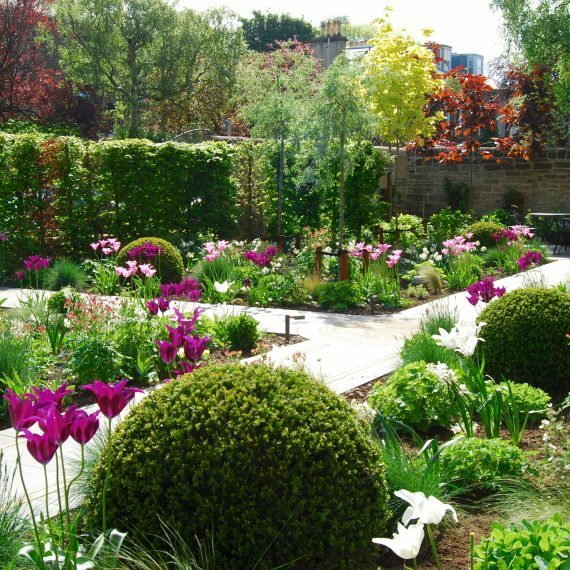 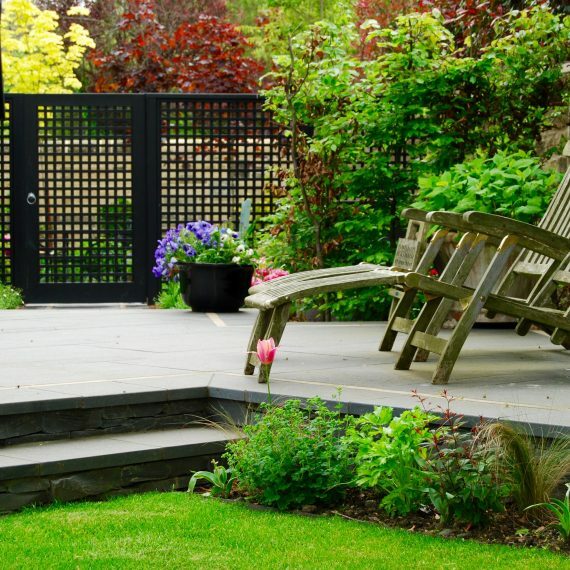 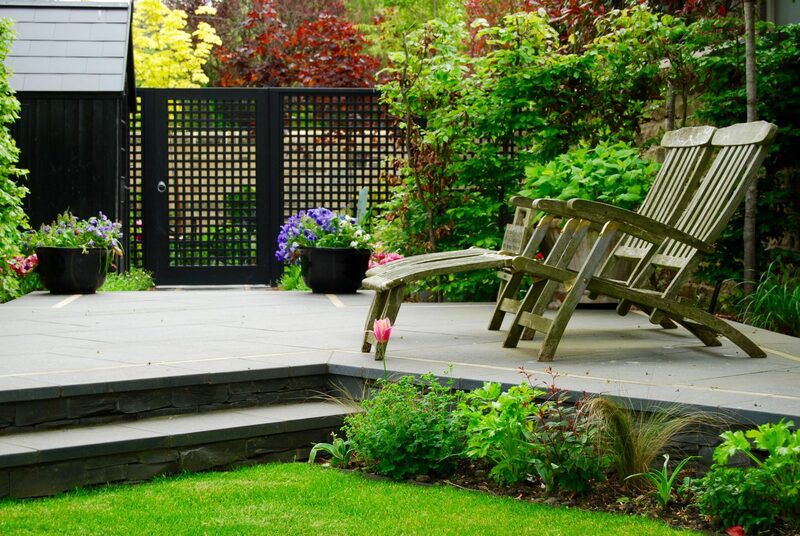 In the sizeable side garden I chose to create a layered effect using beech hedging, black square trellis panels, and lavender hedges. 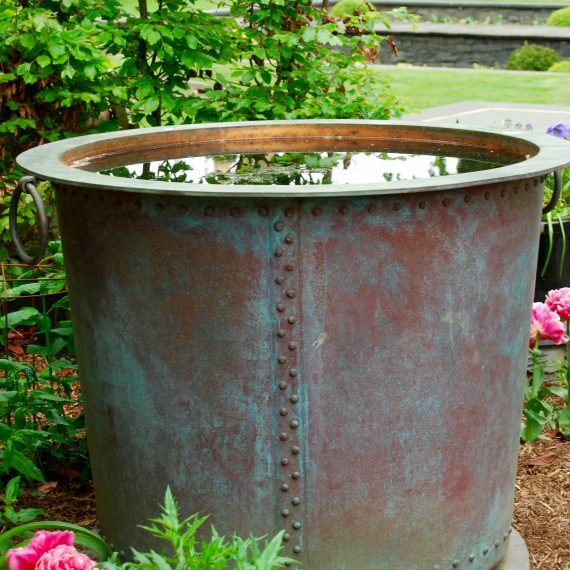 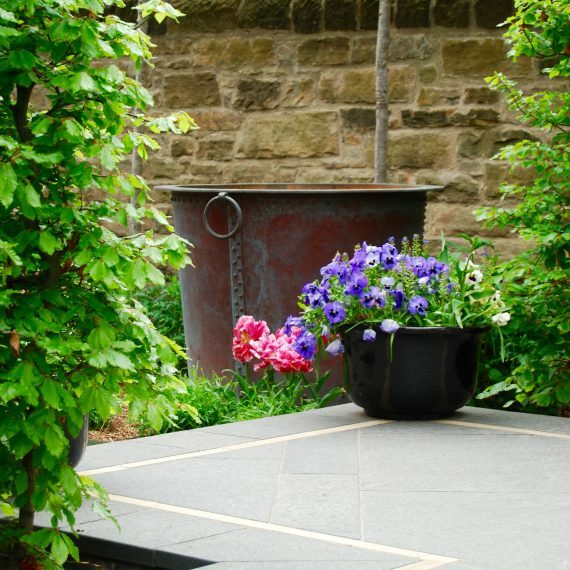 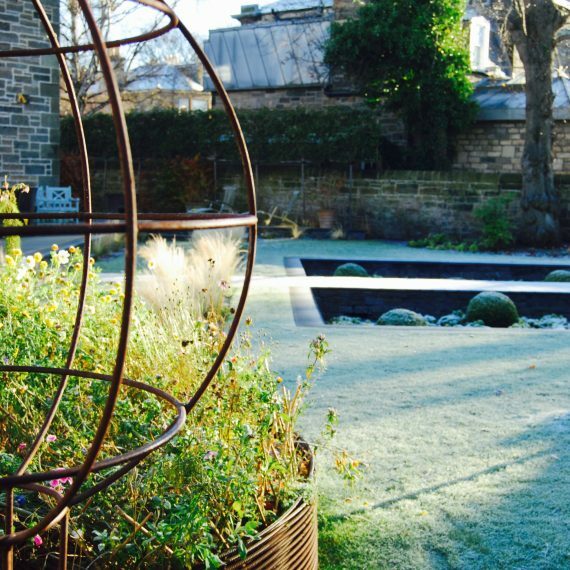 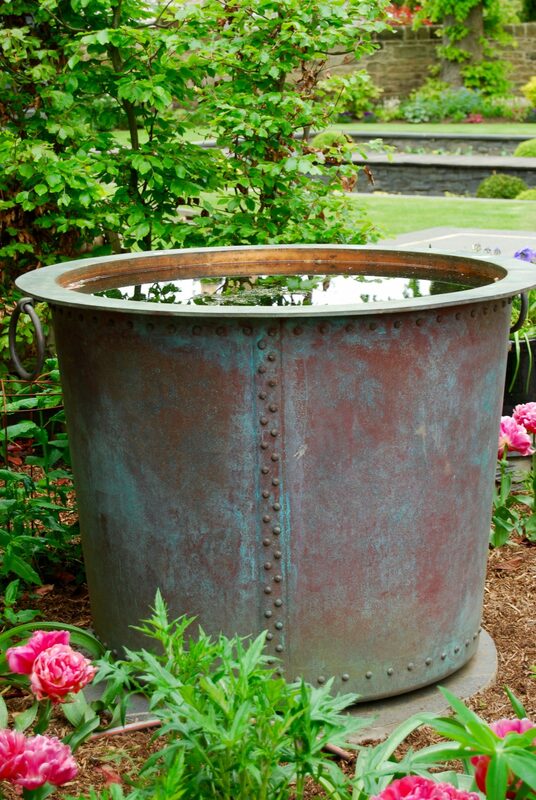 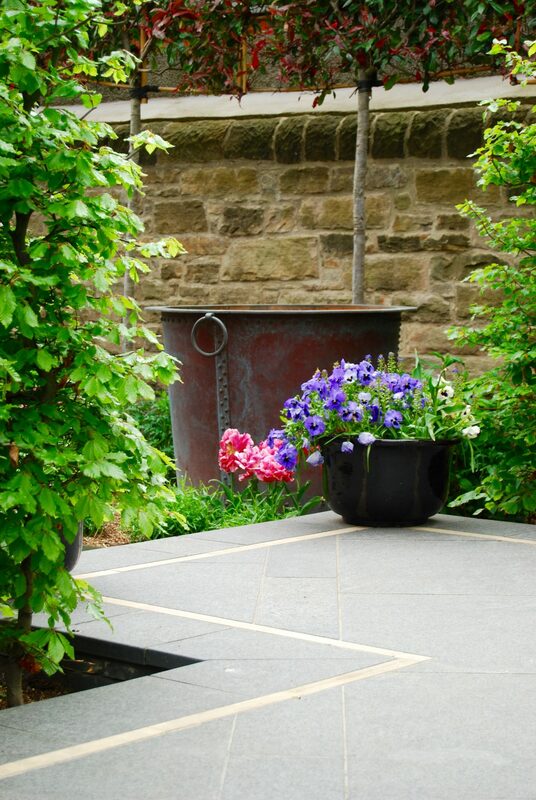 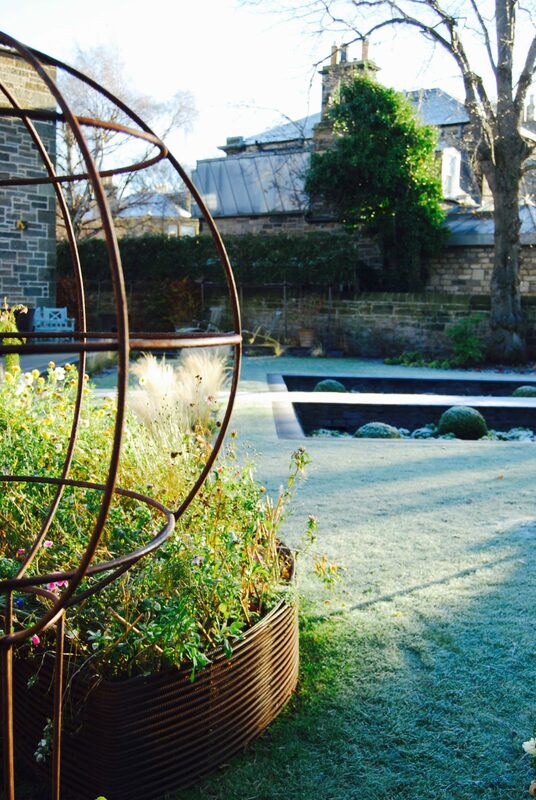 A copper tub water feature brought from the clients’ previous garden sits in amongst herbaceous plants and fan fruit trees and raspberry canes are tucked into warm spots. 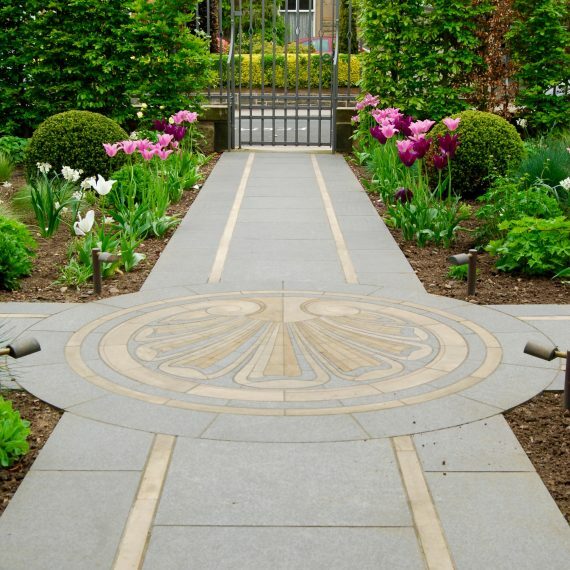 Black basalt paths and patios with a Clashach sandstone inlay surround the house and a stunning cut stone mosaic by Joel Baker takes its inspiration from original stone carvings around the front door. 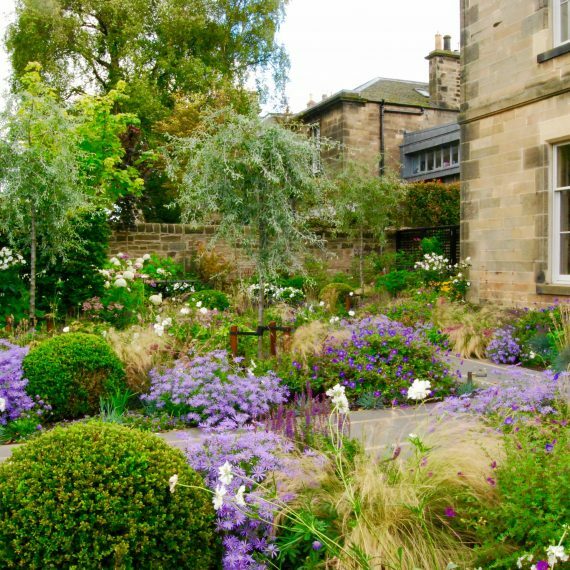 In the front garden I wanted to avoid filling the space with traditional lawns and took the opportunity to heavily plant the garden with flowers. 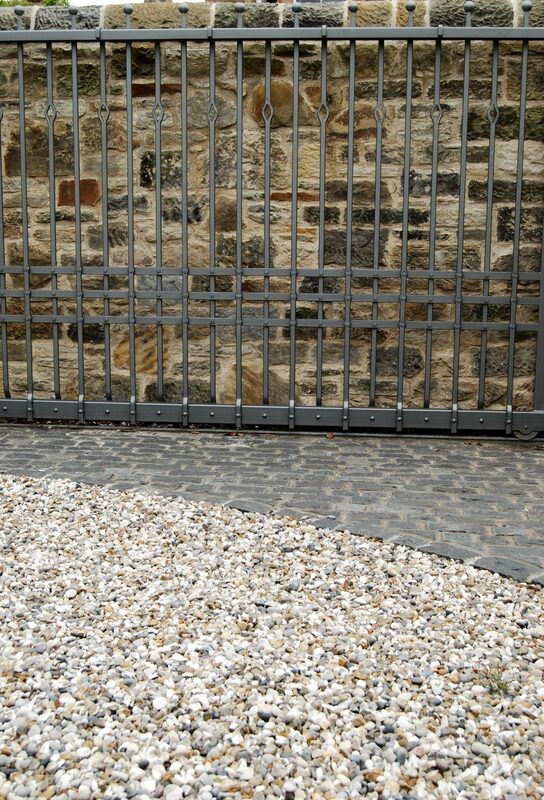 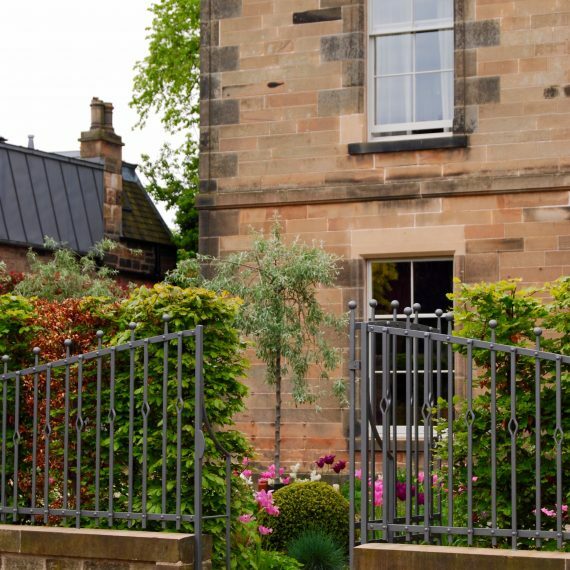 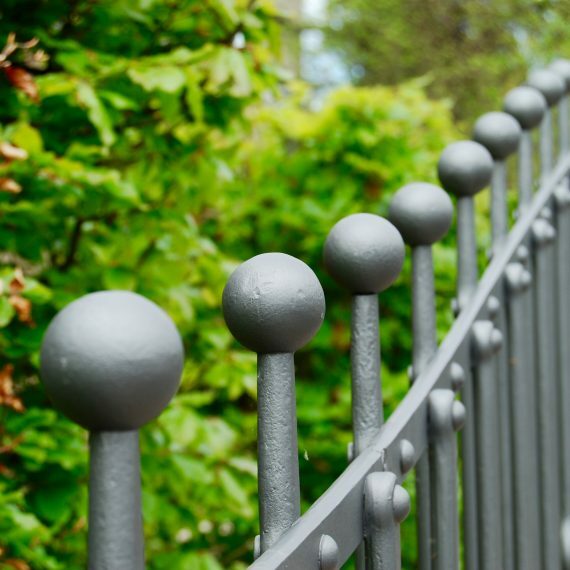 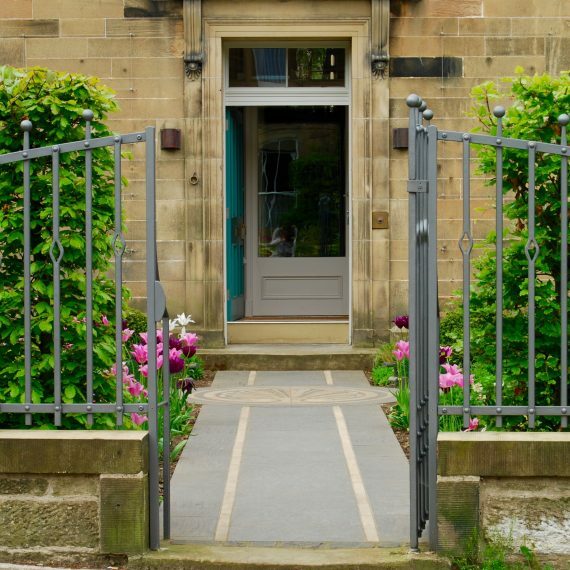 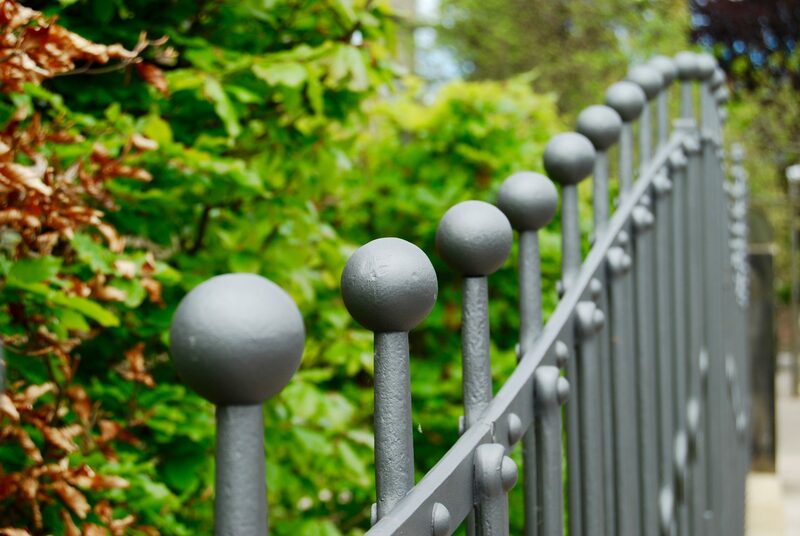 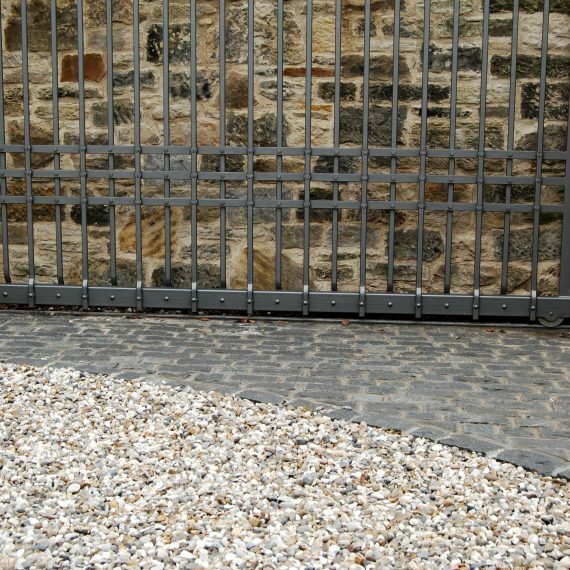 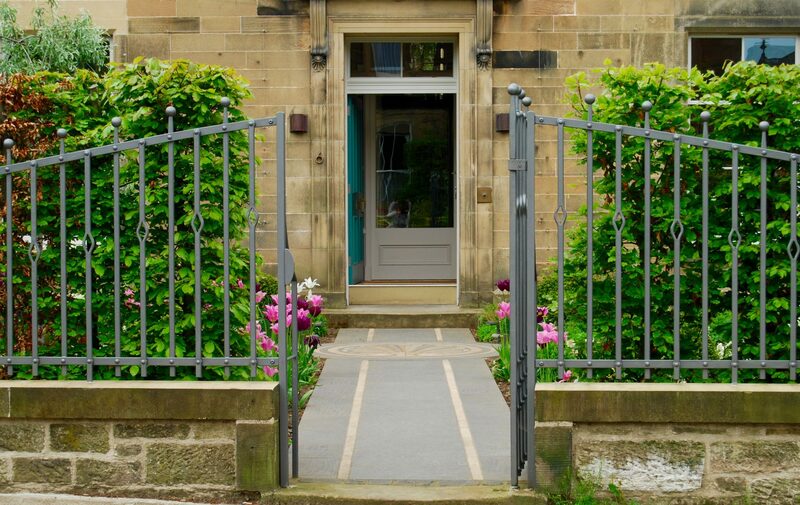 A beech hedge creates an elegant foil for the sweeping railings installed by Ratho Byres Forge and a circular cedagravel driveway provides adequate parking space without excessive hard surfaces. 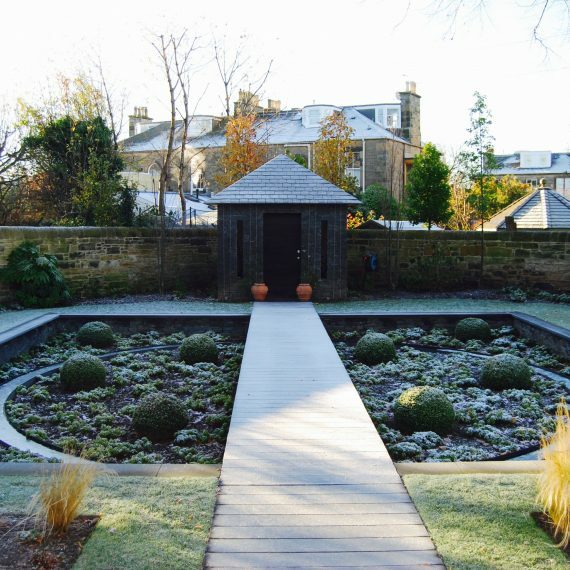 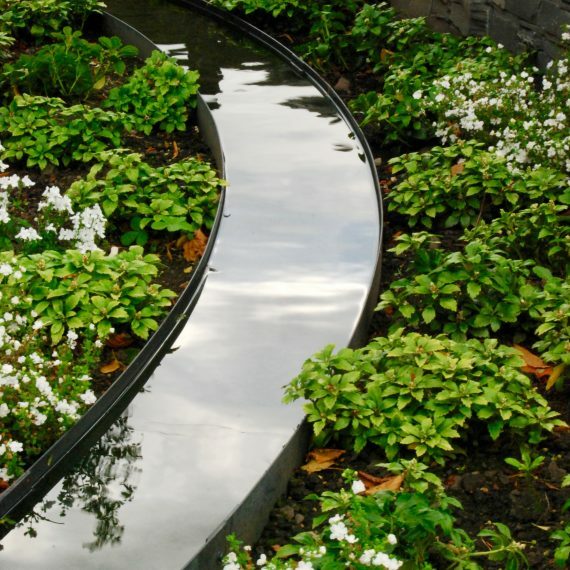 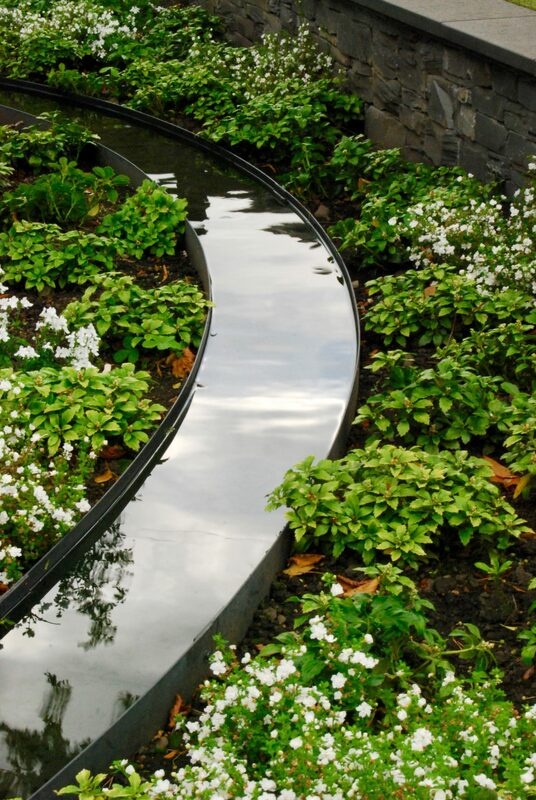 Lighting throughout the gardens picks out features at night and an LED strip light tucked underneath the cope surrounding the sunken garden creates an elegant effect. 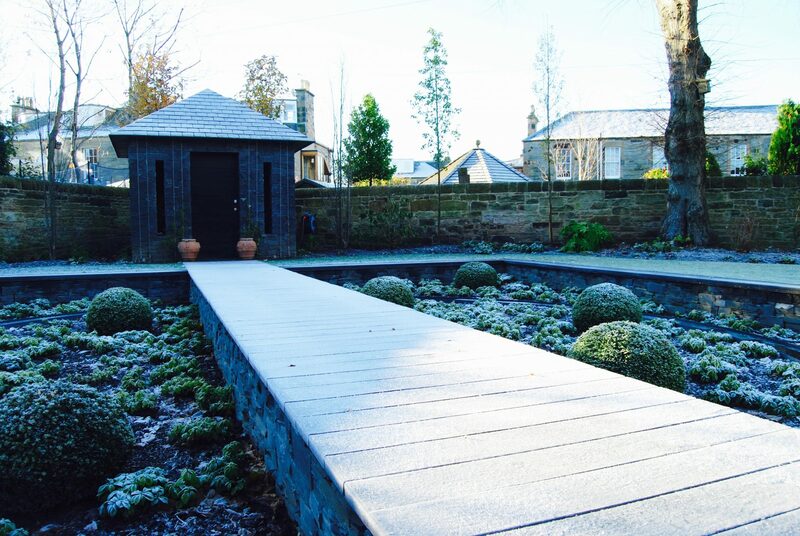 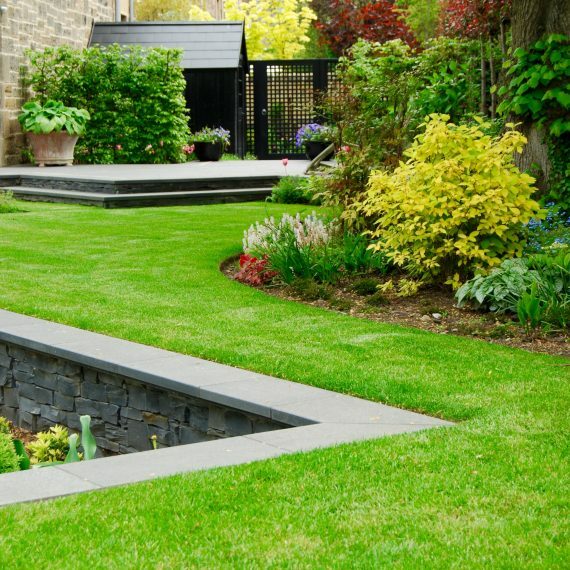 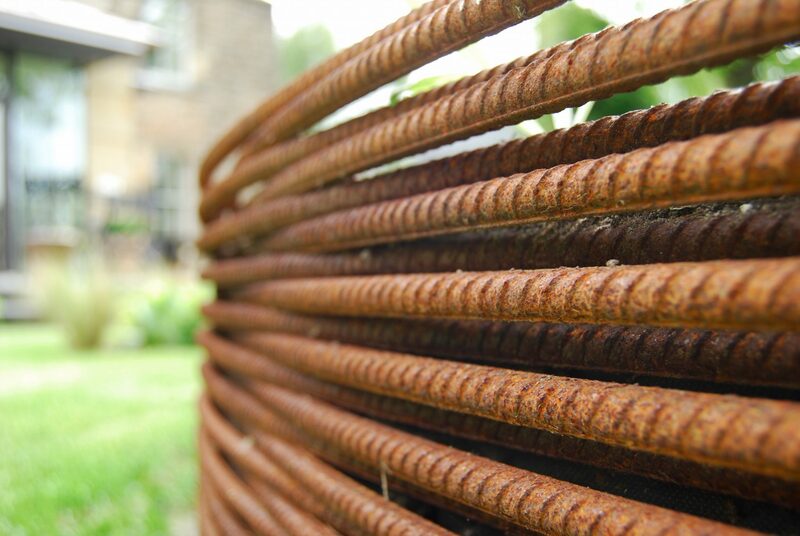 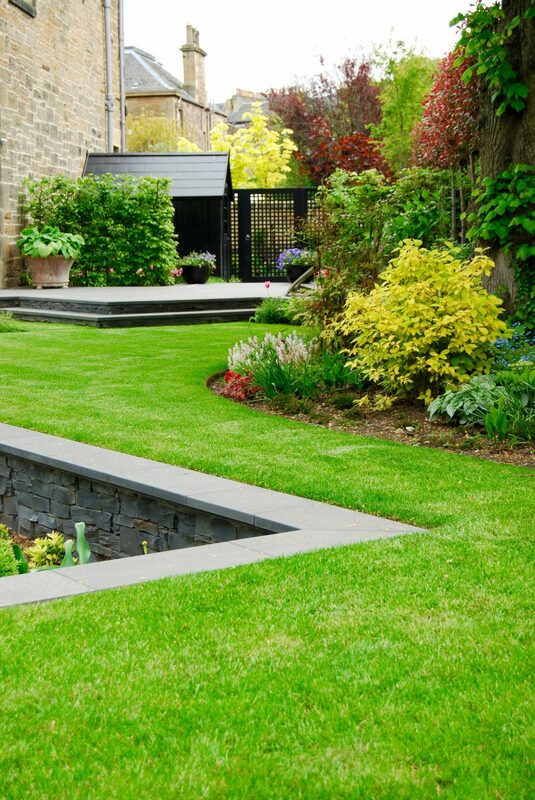 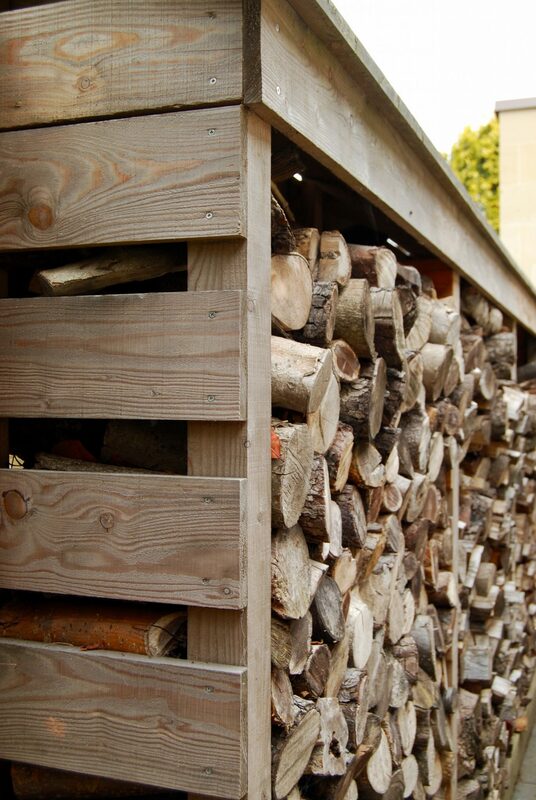 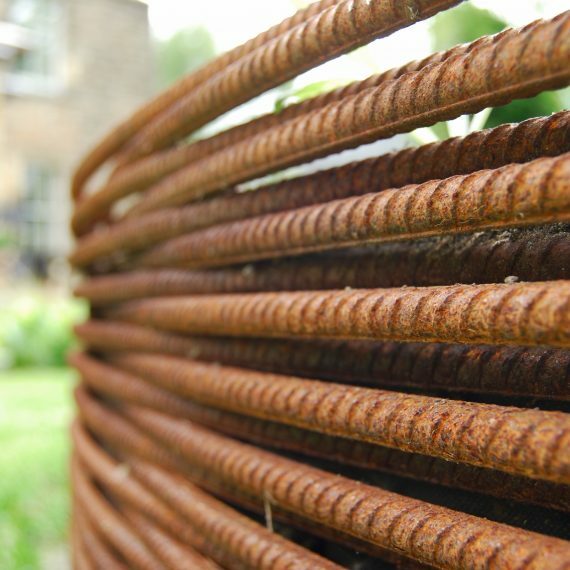 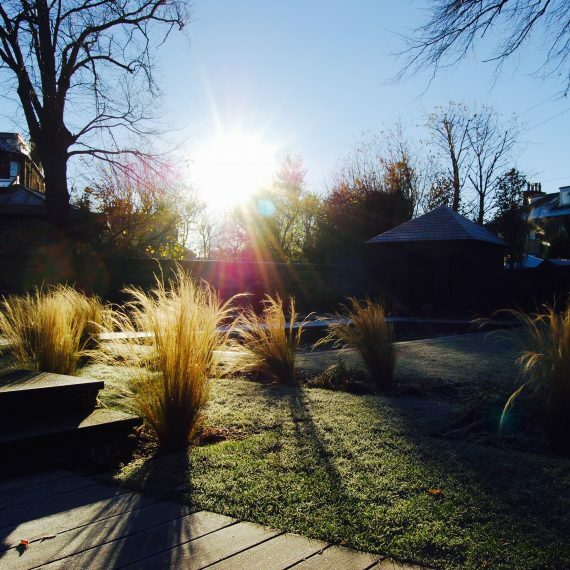 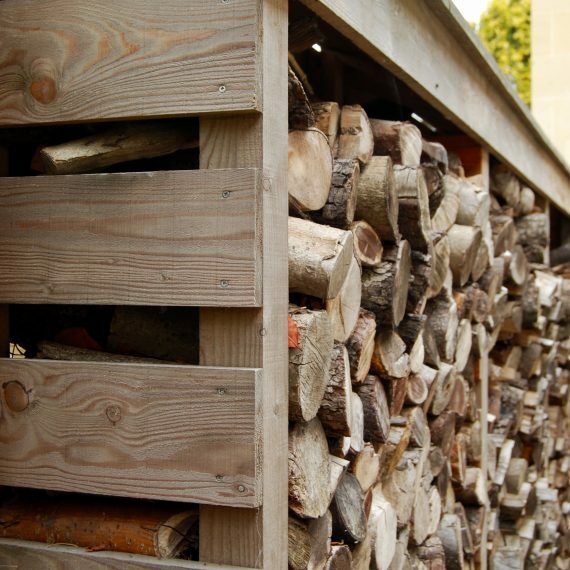 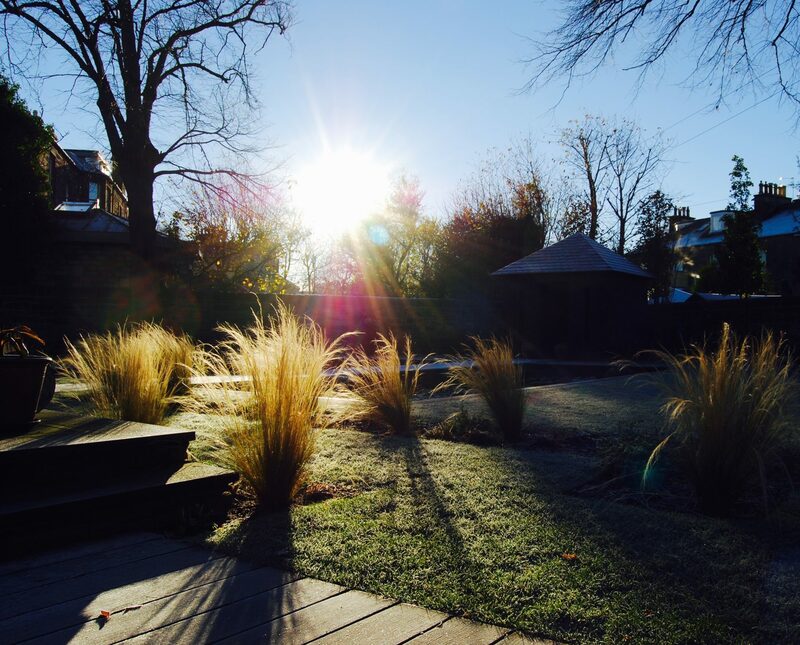 This was another wonderful project to work on with generous and trusting clients, an excellent team of landscapers, skilled craftsmen and women and a fantastic location in which to allow the design to develop.